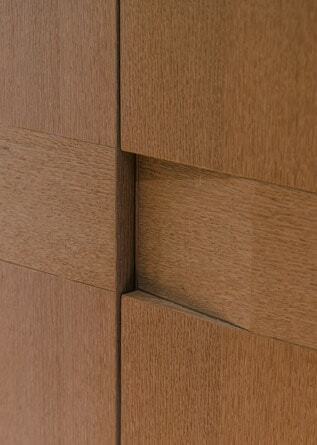 Wood, in many ways, is like the breath of art. 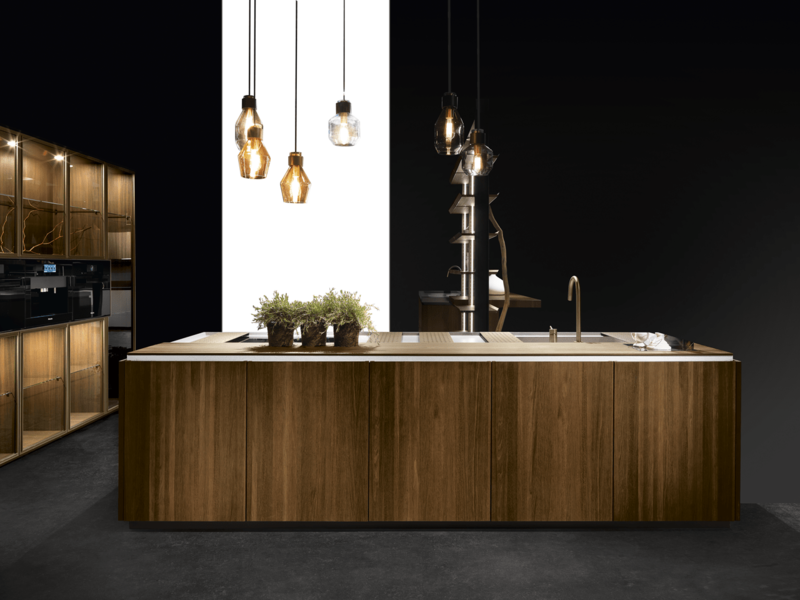 As a natural material, wood is responsive to change. 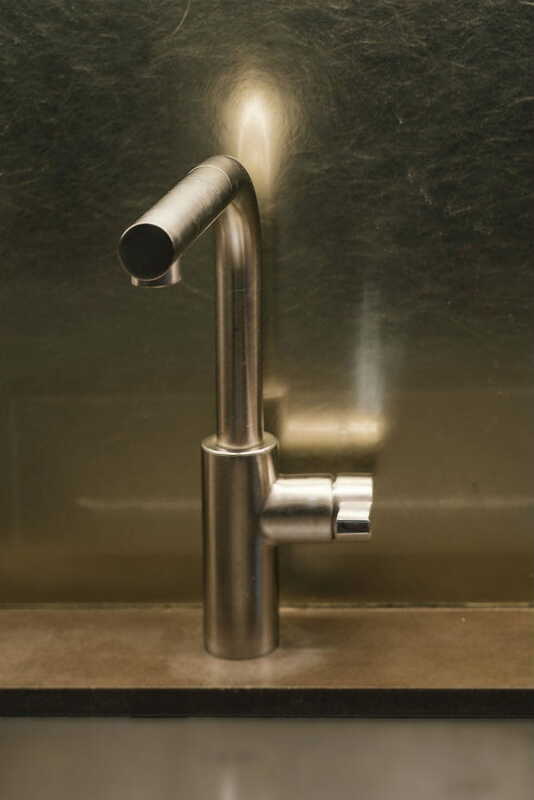 There are many variables that will affect moisture and movement. 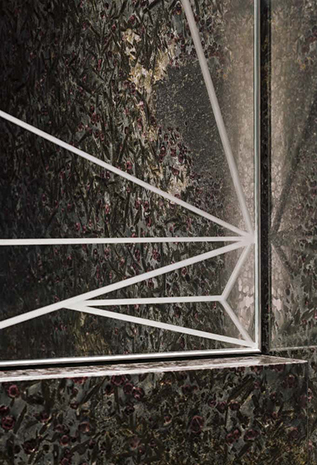 It contracts and expands with humidity. 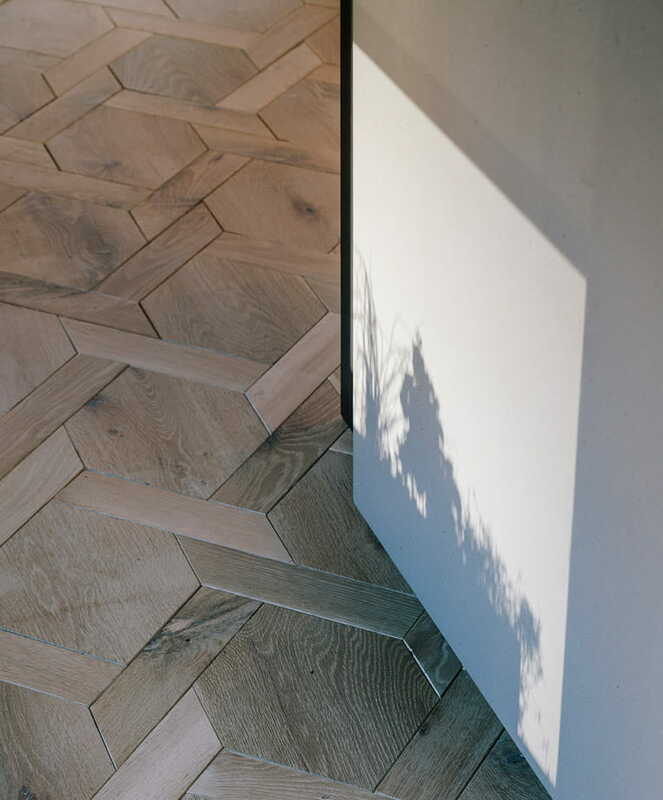 It lightens or darkens with sun exposure, retains a unique character due to its grains and knots. 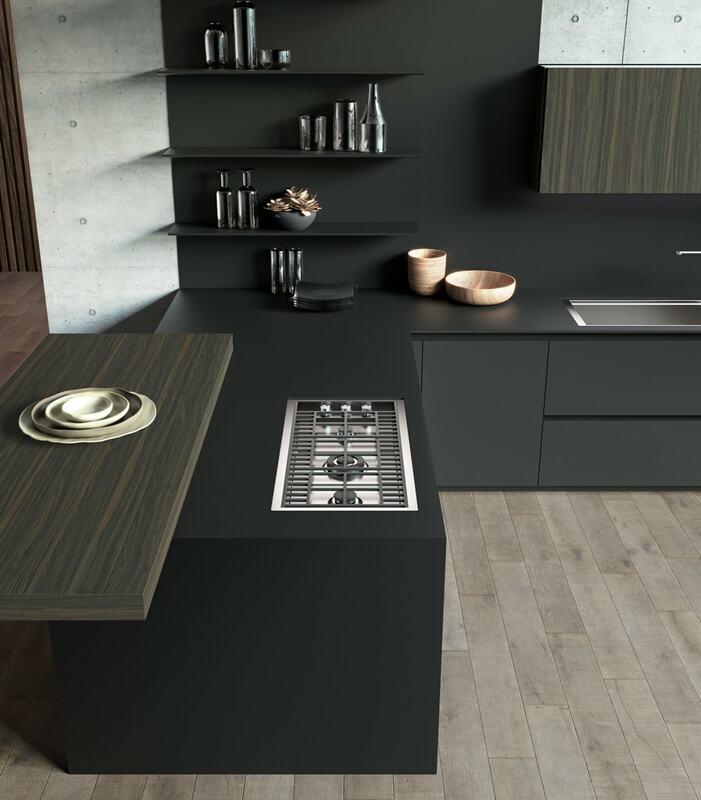 Stone and metal share the wood’s unique qualities of earth-borne textures, but unlike the changing quality characteristics of the wood, stone, and metal preserve an inherent strength with the passing of time. 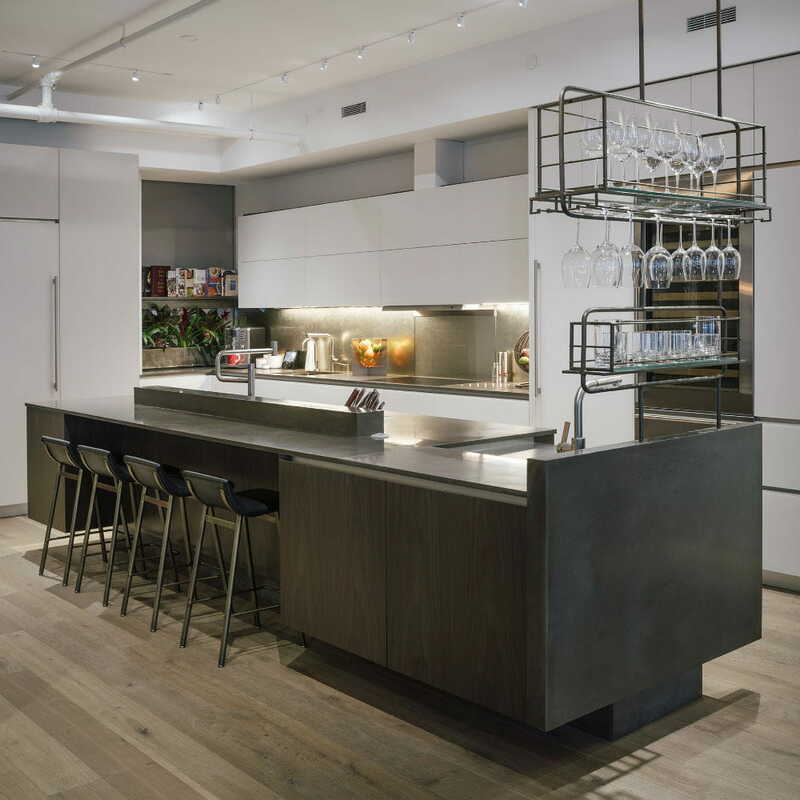 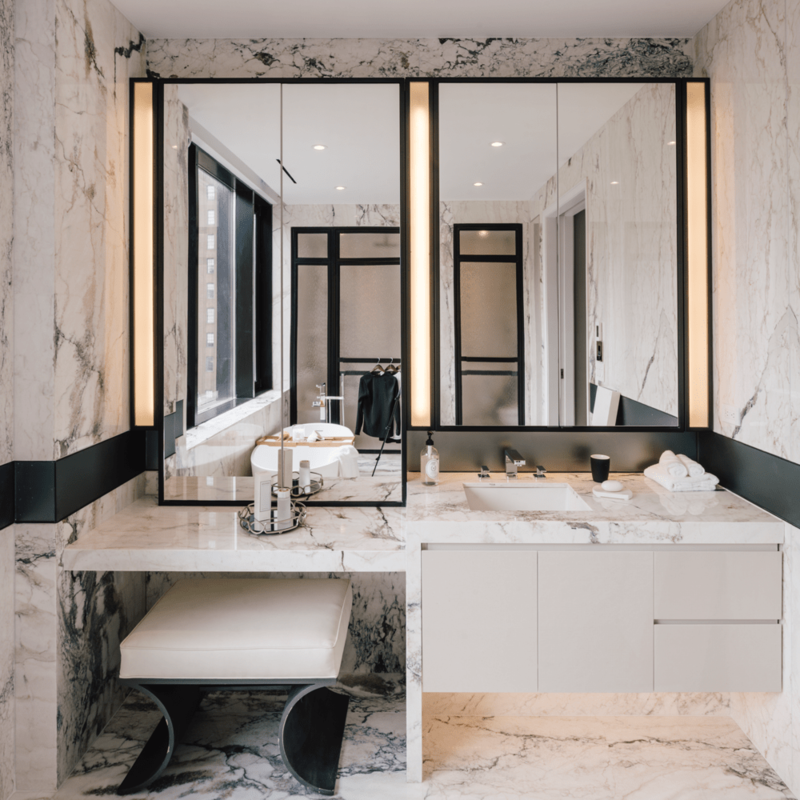 In this Flatiron apartment, wood, stone, and metal are merged to create contrasts of color, touch, and warmth, reflecting on the essence of daily rituals. 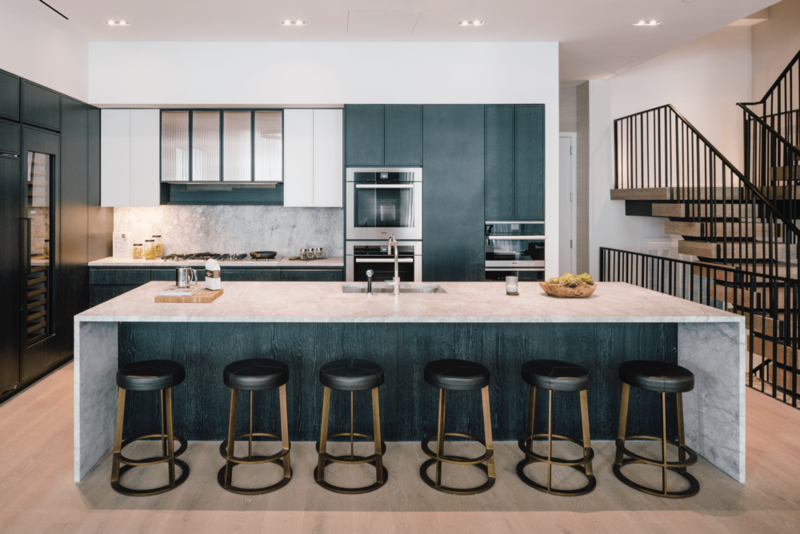 Floor-to-ceiling slabs of wood-grain marble where water slither, hexagonal weaved oak floors that knit open spaces, meticulously crafted brass handles. 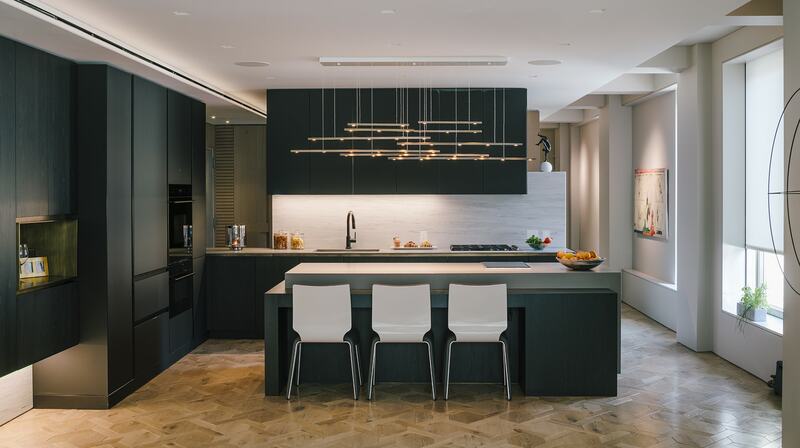 This home is a collection of moments, detailed with the experience of lifetime mastery. 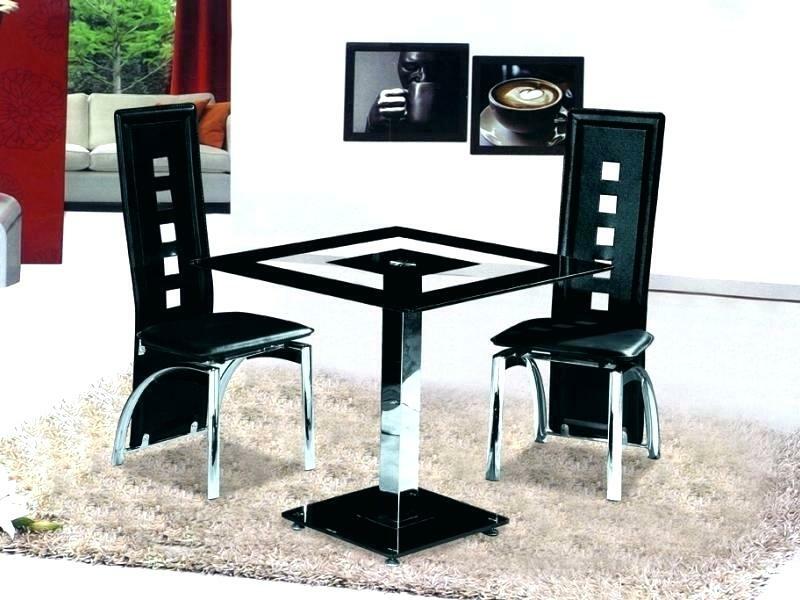 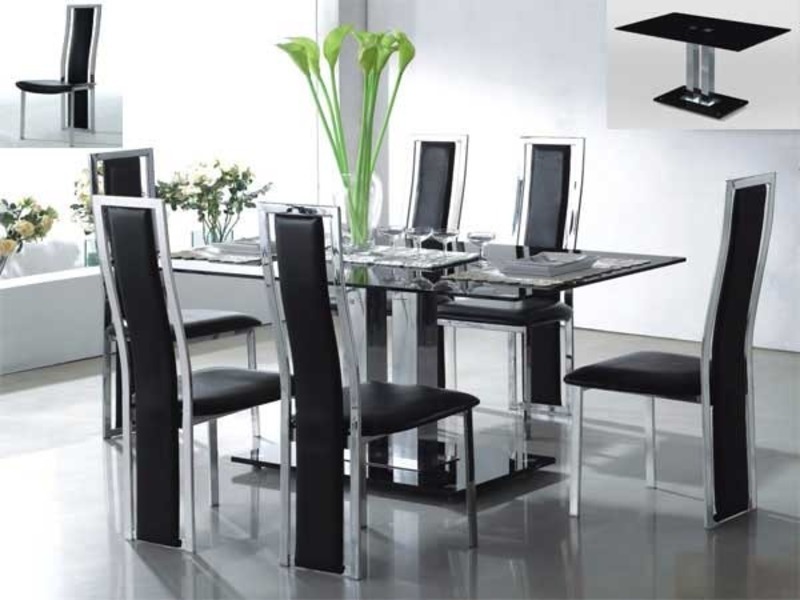 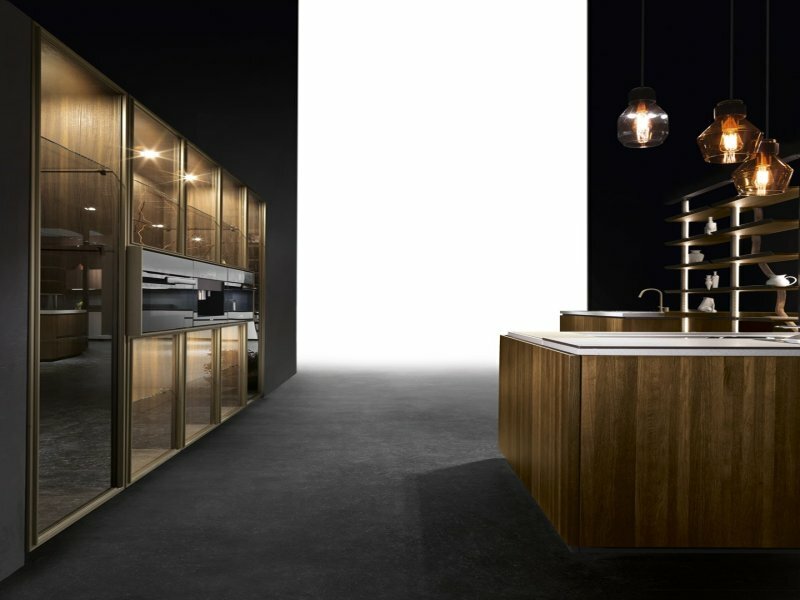 With precise cuts and elaborated compositions, it is the combination of materials and proportions. 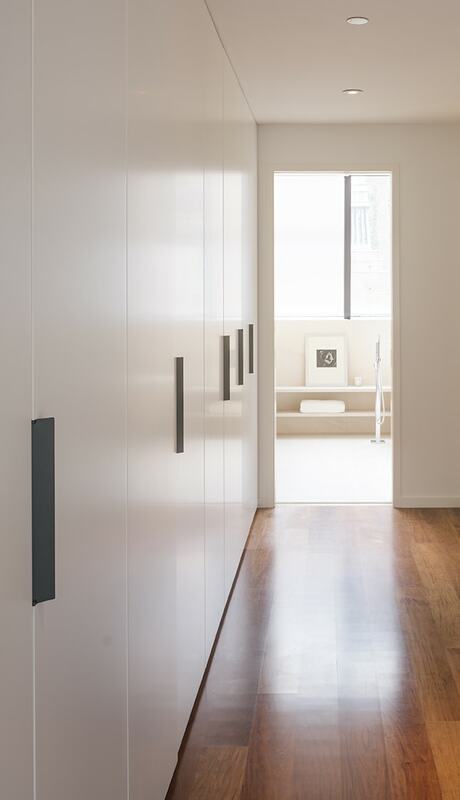 This alignment of pieces is turning this space into a home. 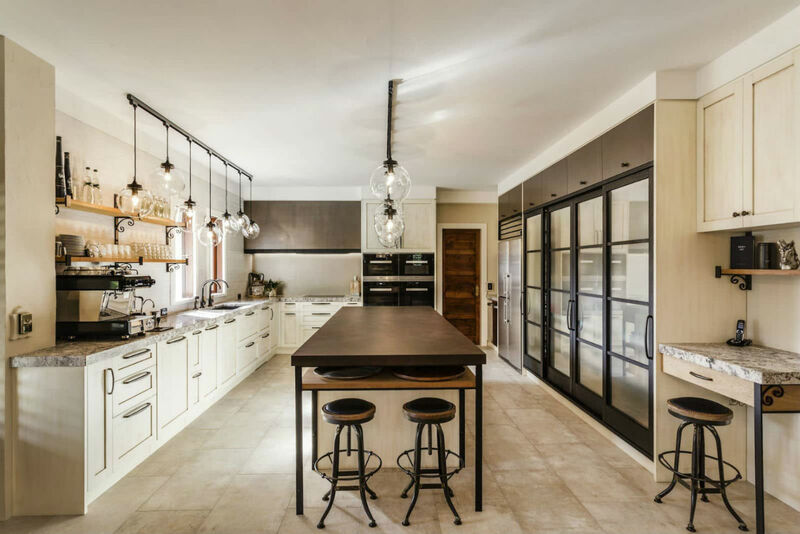 Achieving continuity in a home is about refining. 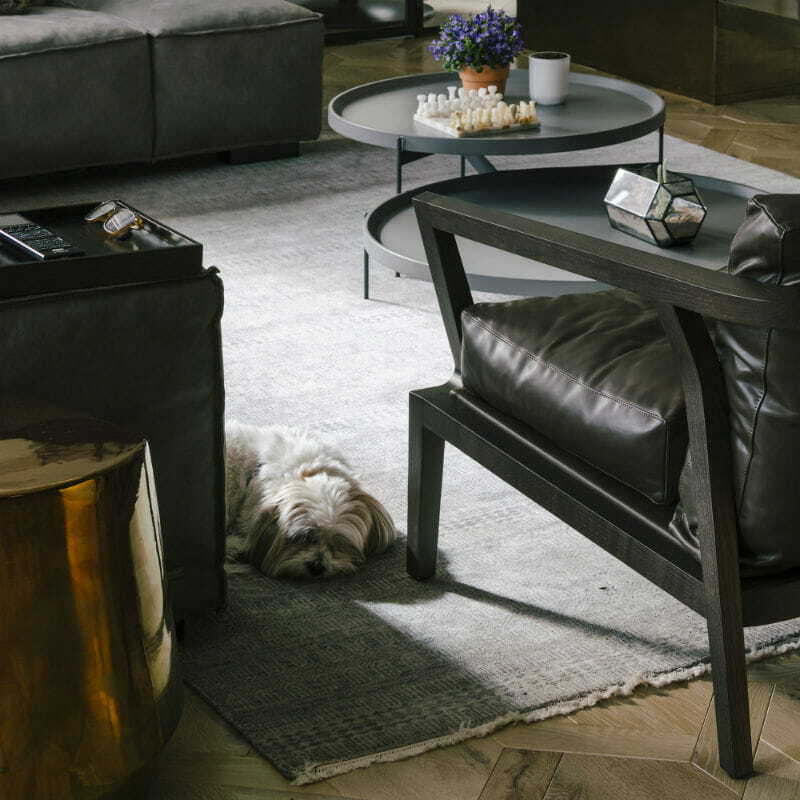 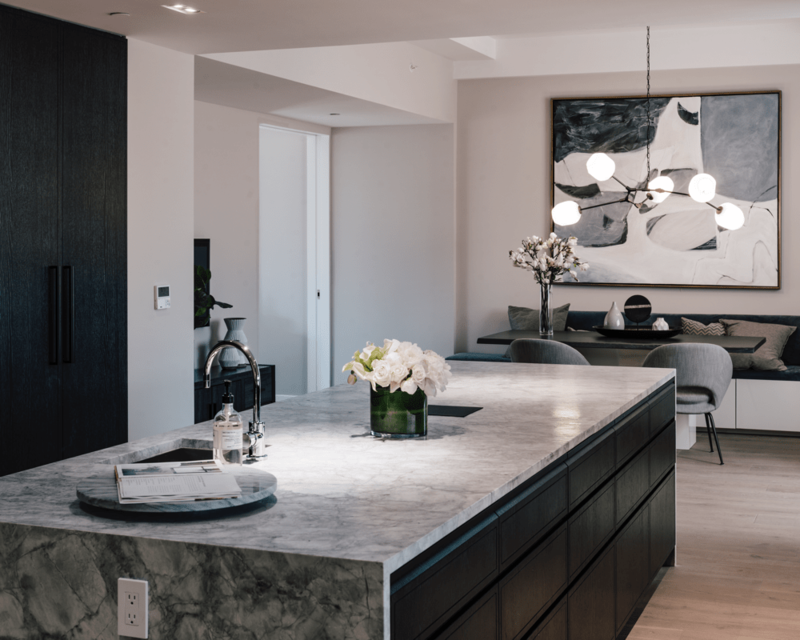 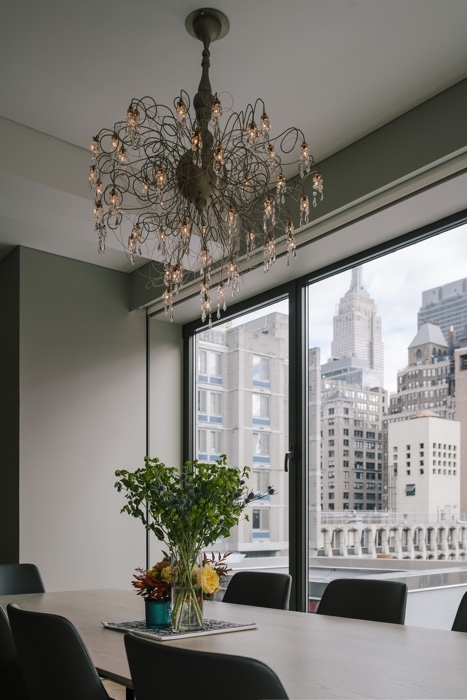 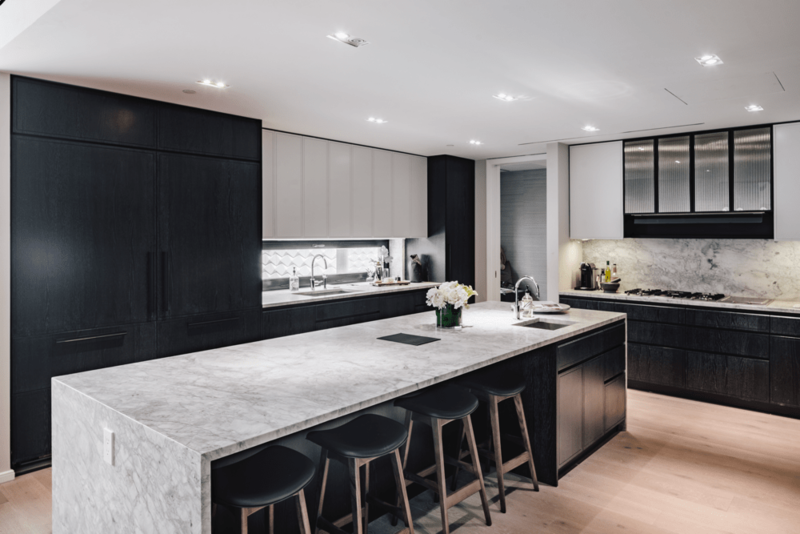 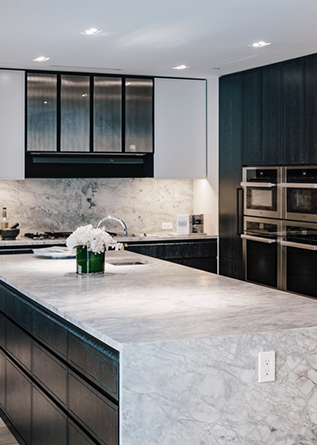 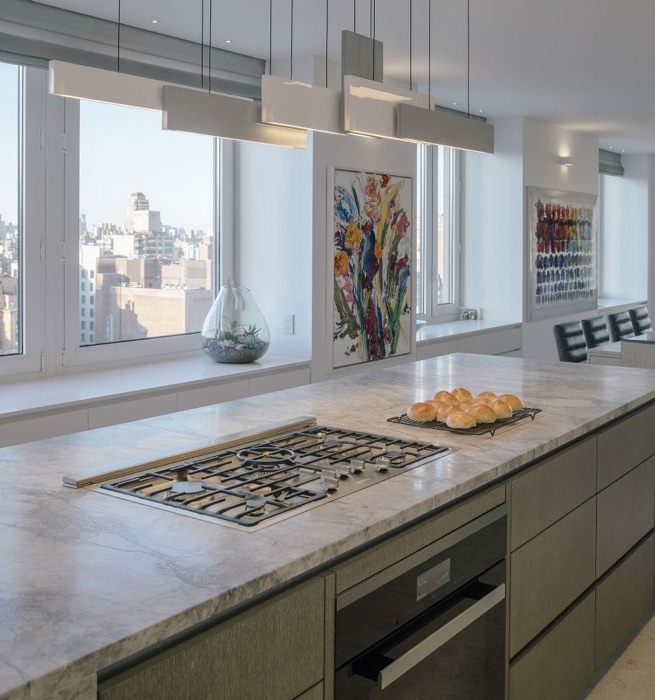 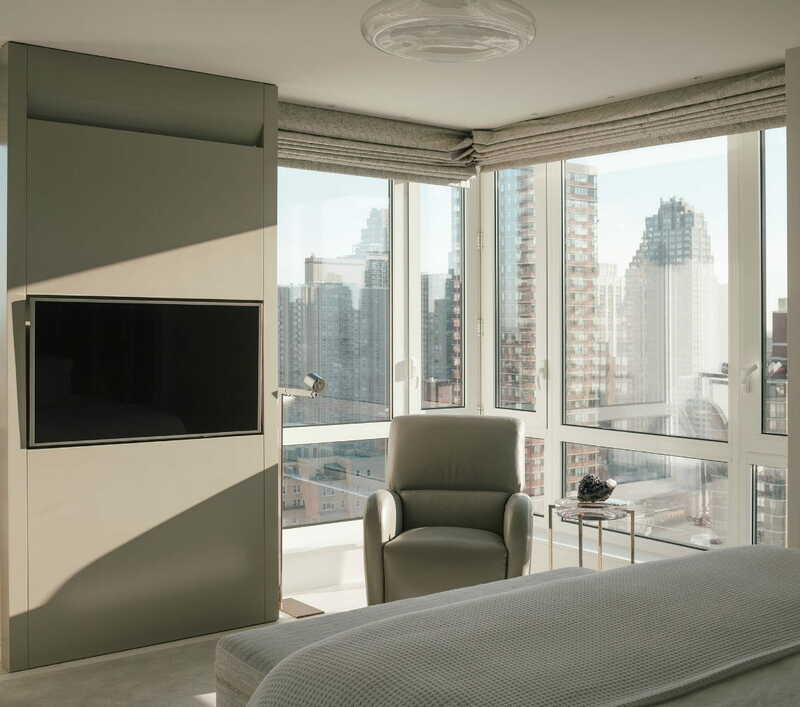 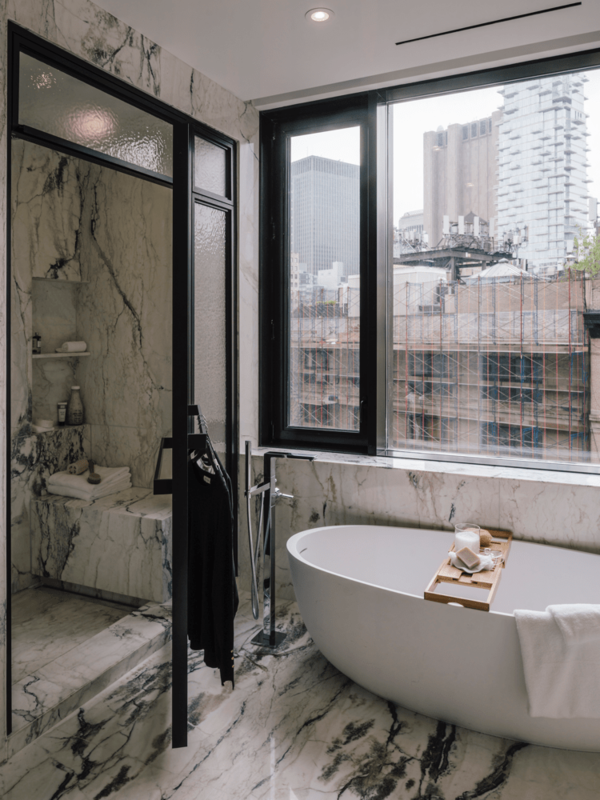 The residents of this Upper East Side apartment embrace their personal joys and have made a sequence of spaces of this one-floor spacious flat with defined characters, all viewing the breathtaking landscape of the city. 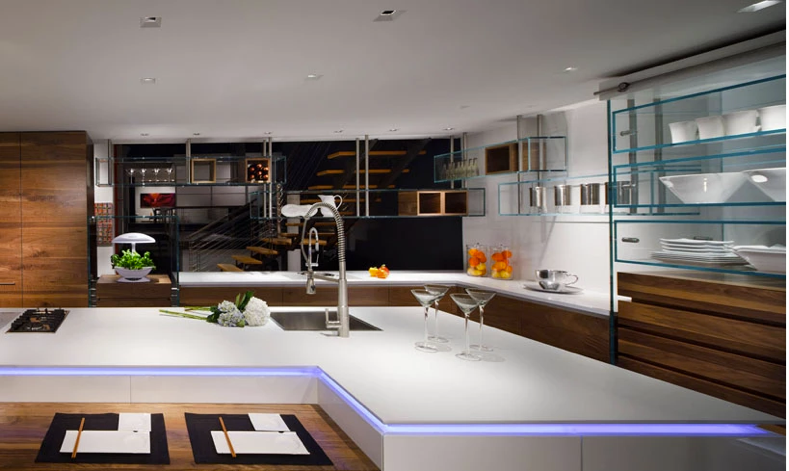 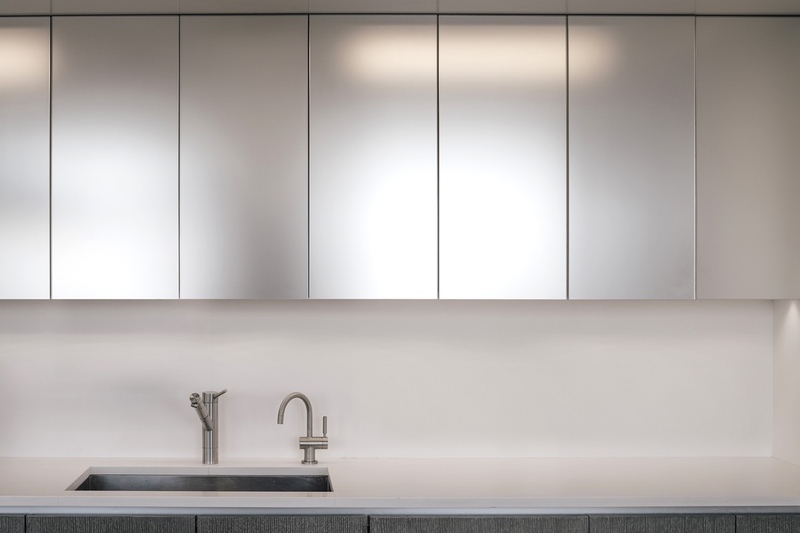 During the hours of the day, the sun rises and sets on the living-dining-kitchen area, aligns with the different light exposures, and enhances its reflections with angular walls and reflected ceilings. 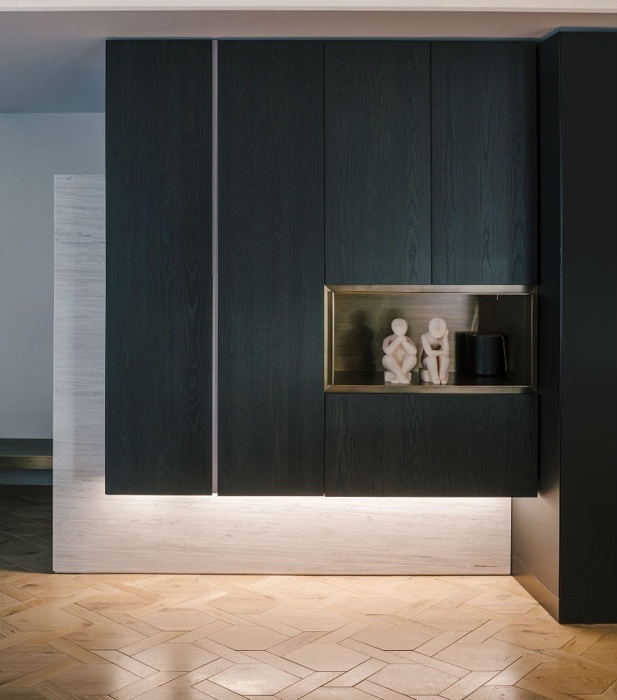 Customized faceted-wood cabinetry naturally intertwined in the space and the millwork pieces play with different light reflections. 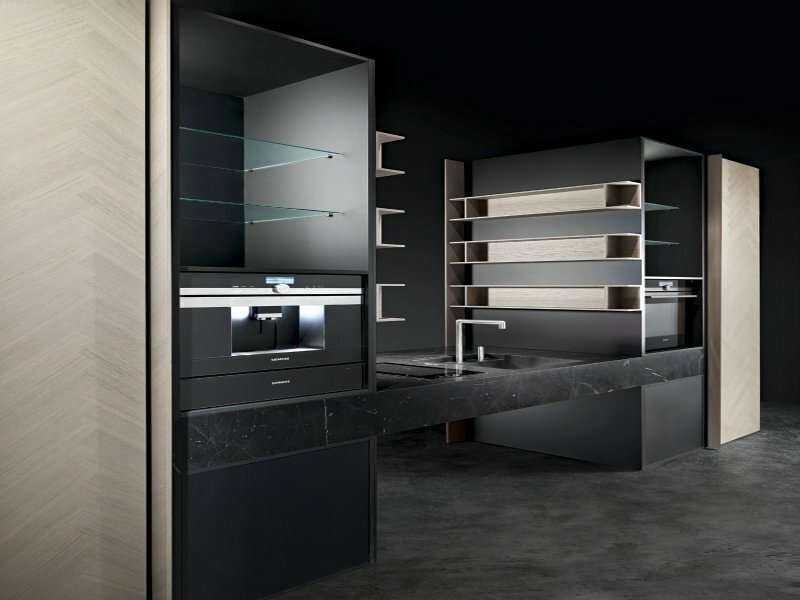 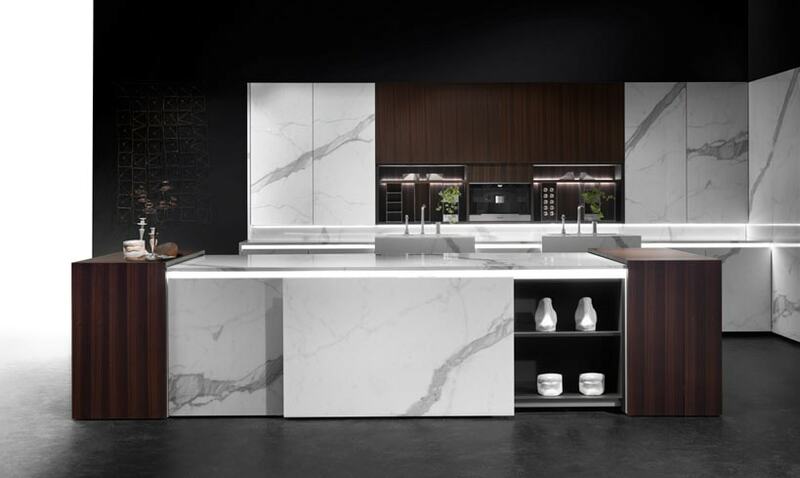 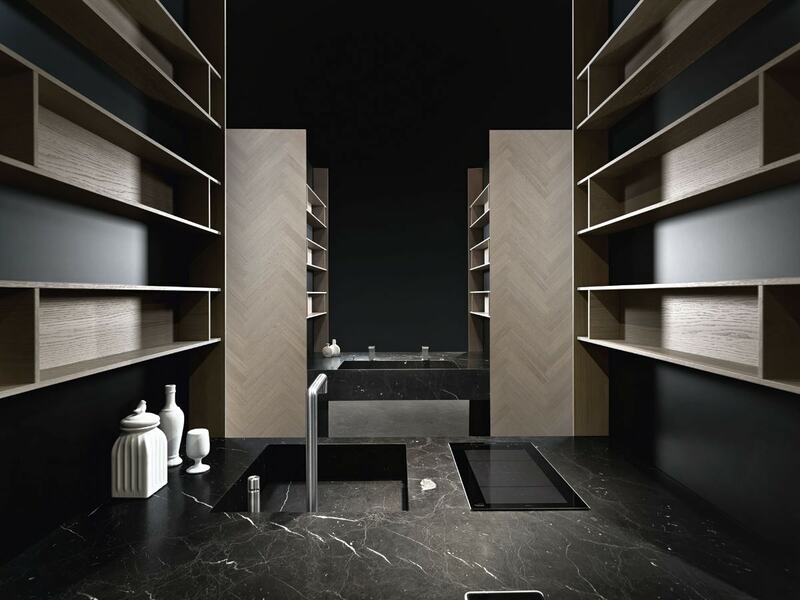 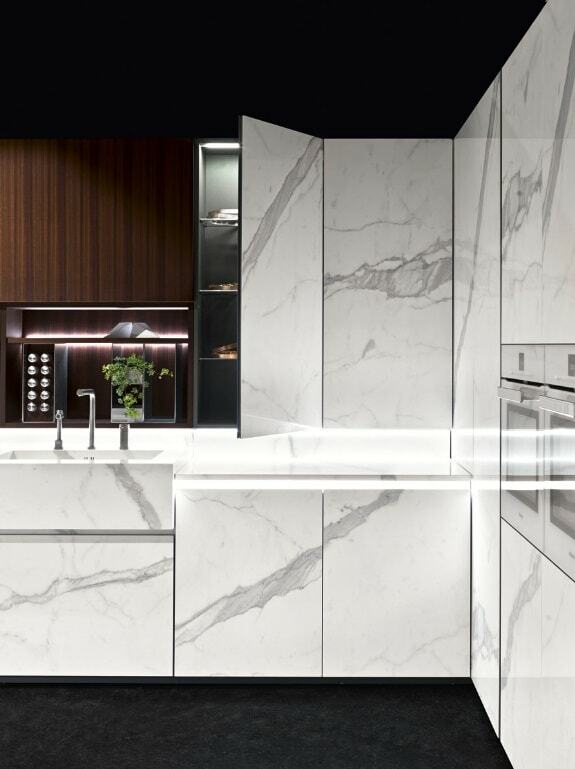 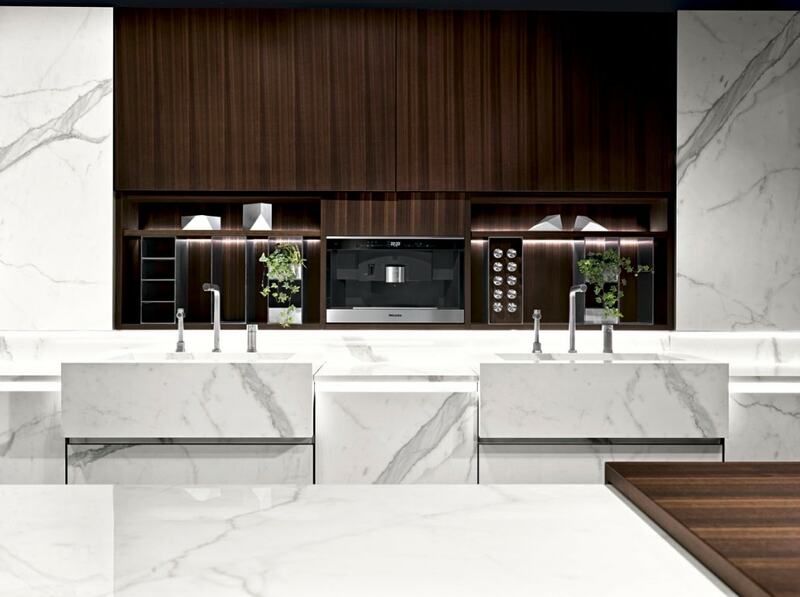 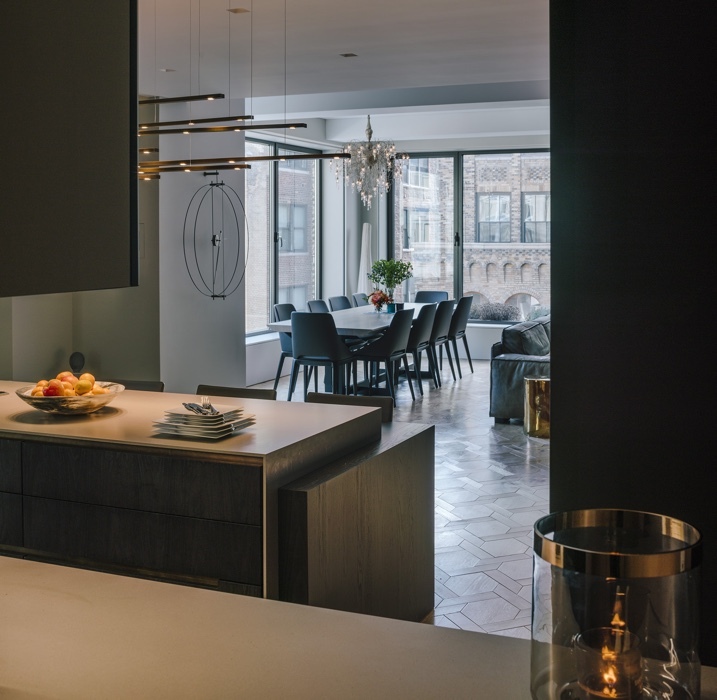 The acid mirrors from Ikonni’s Kitchen Cabinet Doors line, embellish the surroundings, while the leather-finished stone in the kitchen island alludes to the city views with matte light reflections. 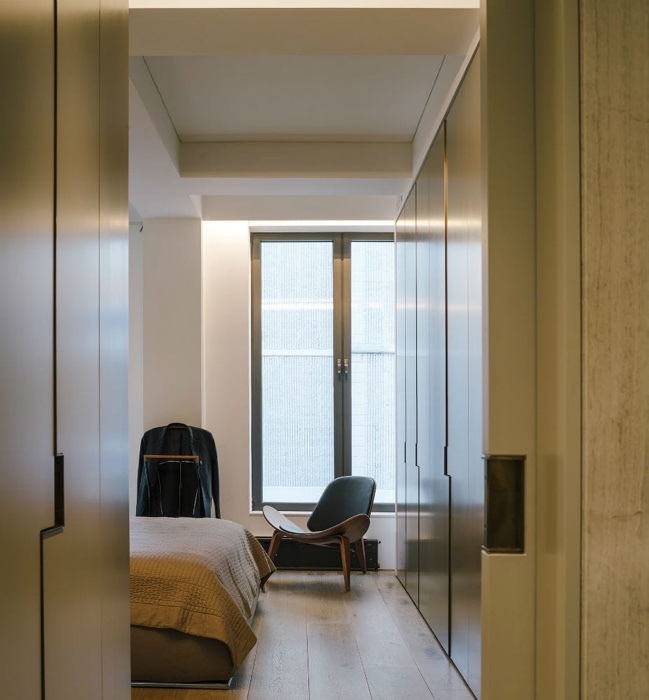 The different rooms in the apartment, all equipped with unique millwork treatments. 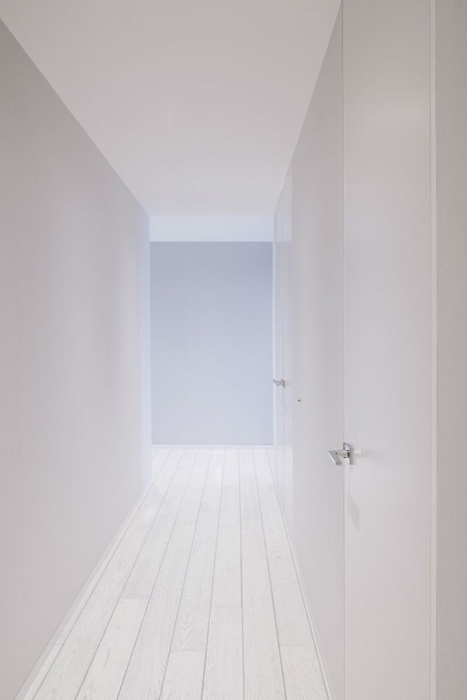 The white corridors let the light reach every angle and every corner of the apartment. 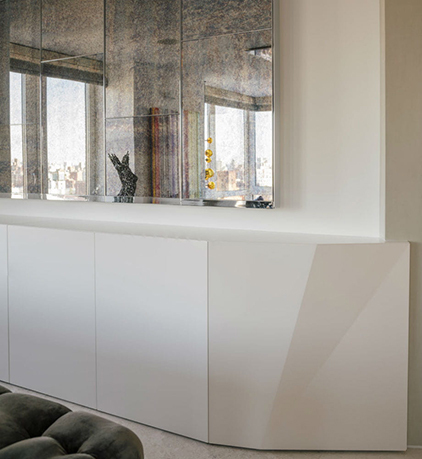 Wall units, for media and ornaments, integrate knife-edge light coves and organized compartments in the painting room. 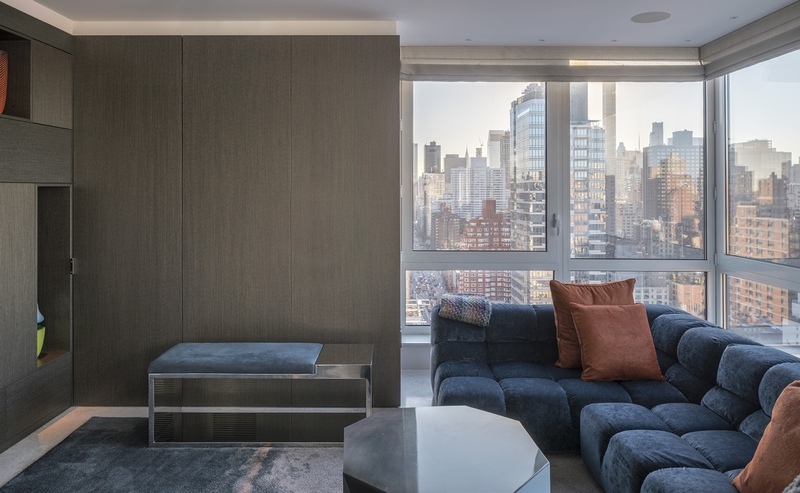 The flow and character of this apartment, overlooking the city, goes along with the movement of light, and the refined millwork. 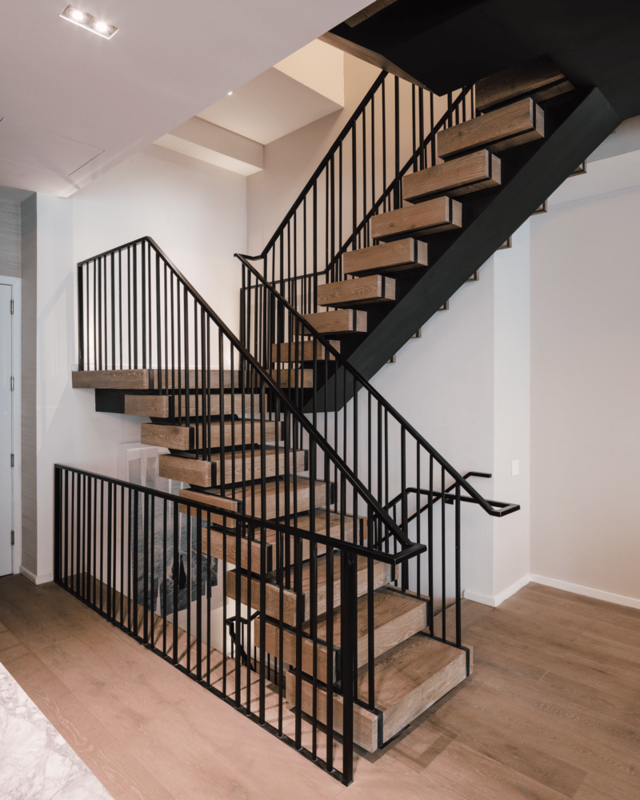 Freed from constraints, the staircase of this Upper East Side townhouse becomes a rhythmic thread of spaces turning into ascent that seems to levitate without any tangible support. 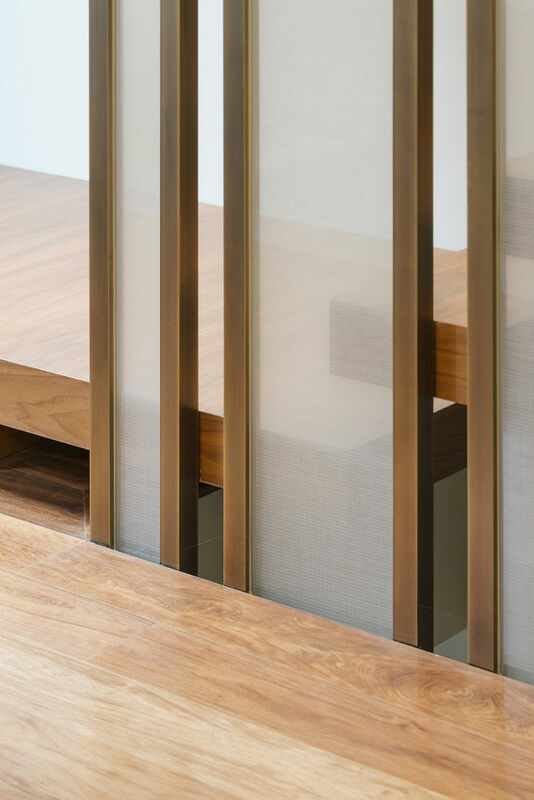 It organizes the movement between floors, allowing the light to slip through the floating walnut treads. 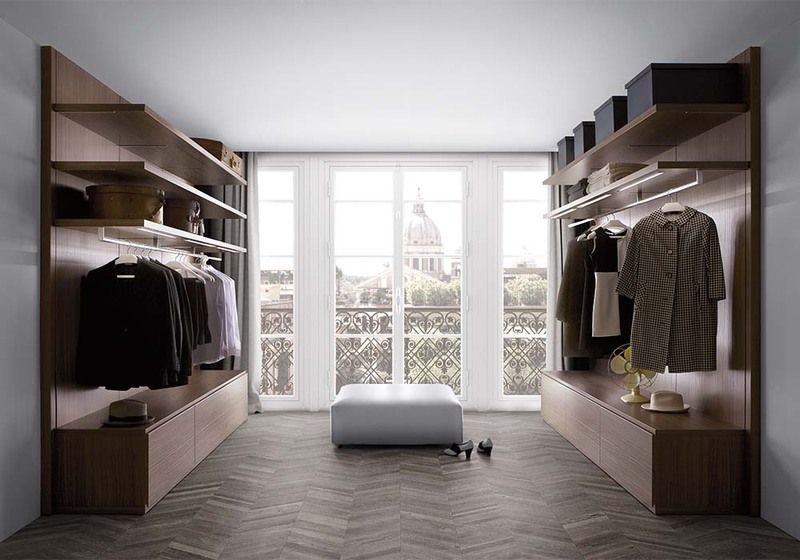 It stimulates the desire to pause on the landings, just before entering the floor, in a geometrical illusion, solid walnut blocks float and adopt the shape of a square, a triangle, or a rectangle, to adjust to the different phases of the levitation. 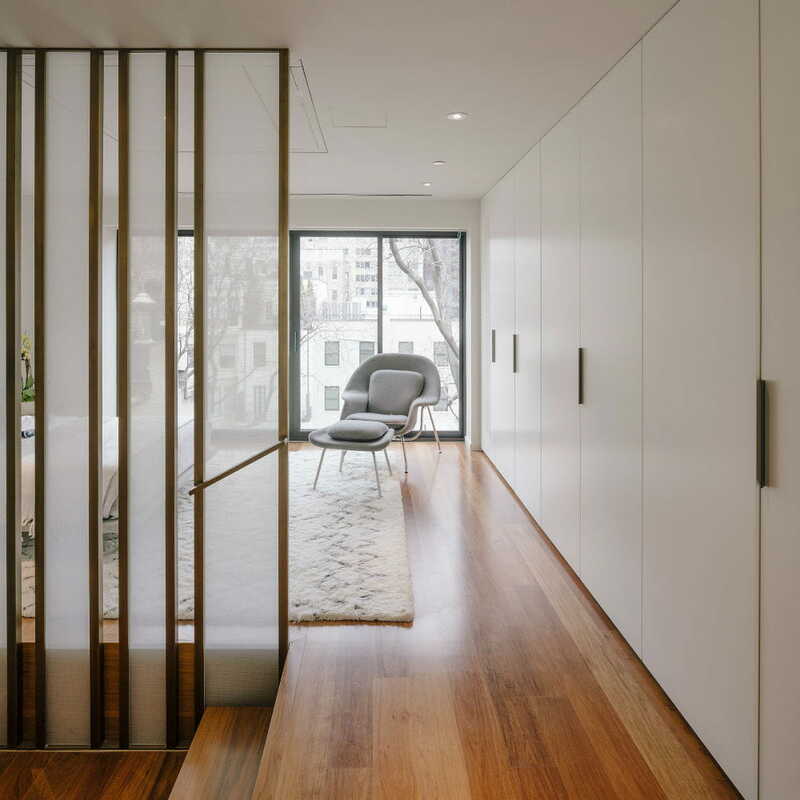 The rhythmical screens that sharply cut through the floors let the light penetrate, as it goes through faint reflections, picked up on the glass panes and brass edges. 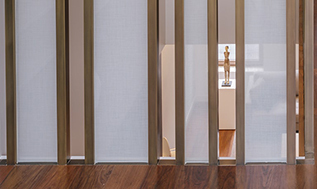 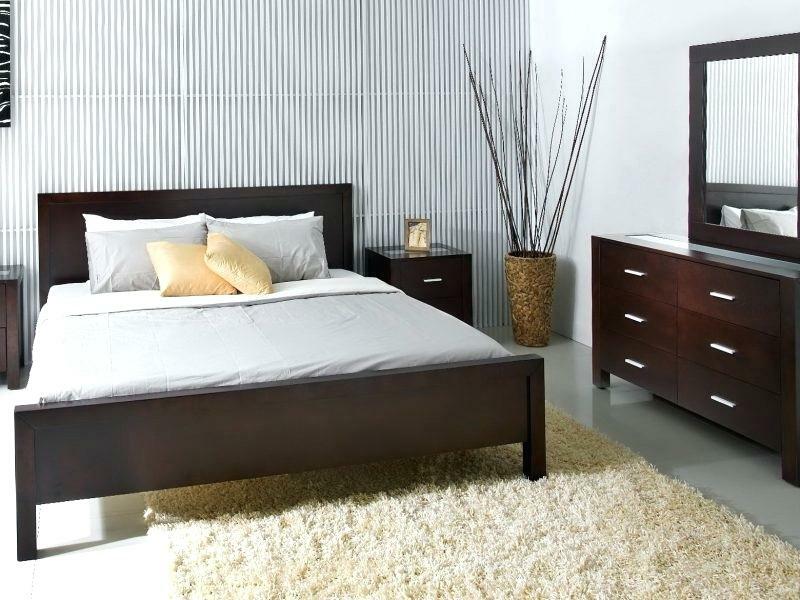 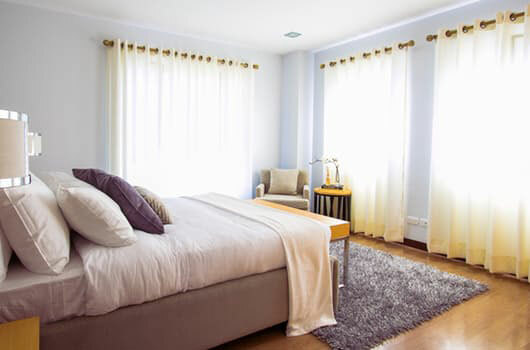 It performs as the wall that protects the bedrooms, yet includes each and every one of those, through different levels. 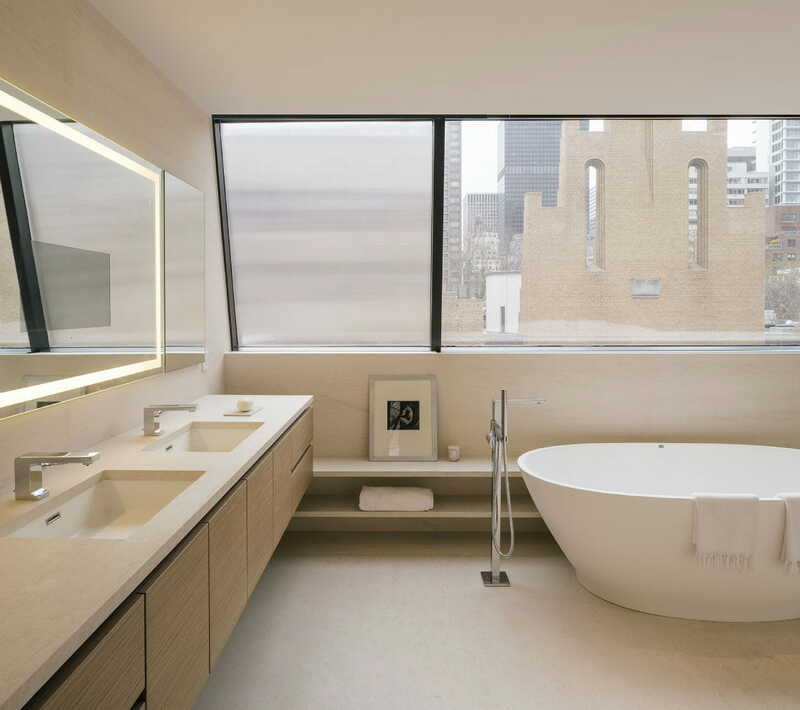 Linen fabric applied to the glass tunes the light and insinuate the remarkable views. 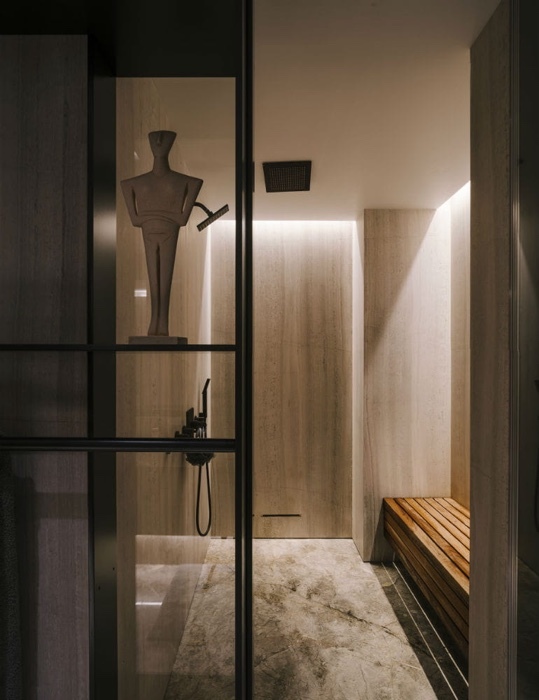 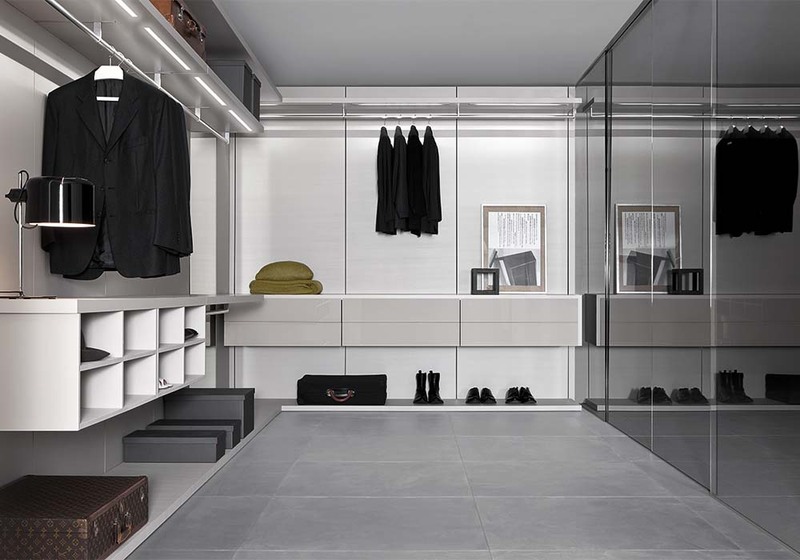 Long closet walls compliment the vertical rhythm of the paneling and direct the circulation to the rooms on the floors. 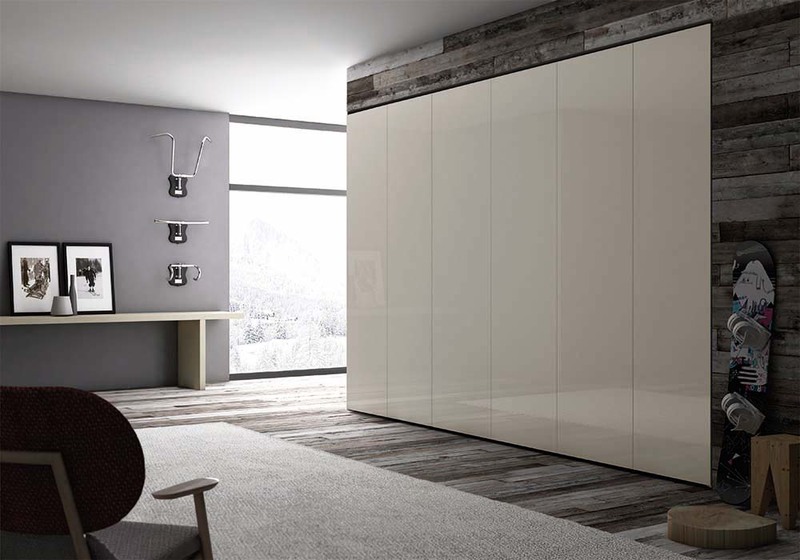 This richness releases the imagination and gratifies the partitions of different spaces. 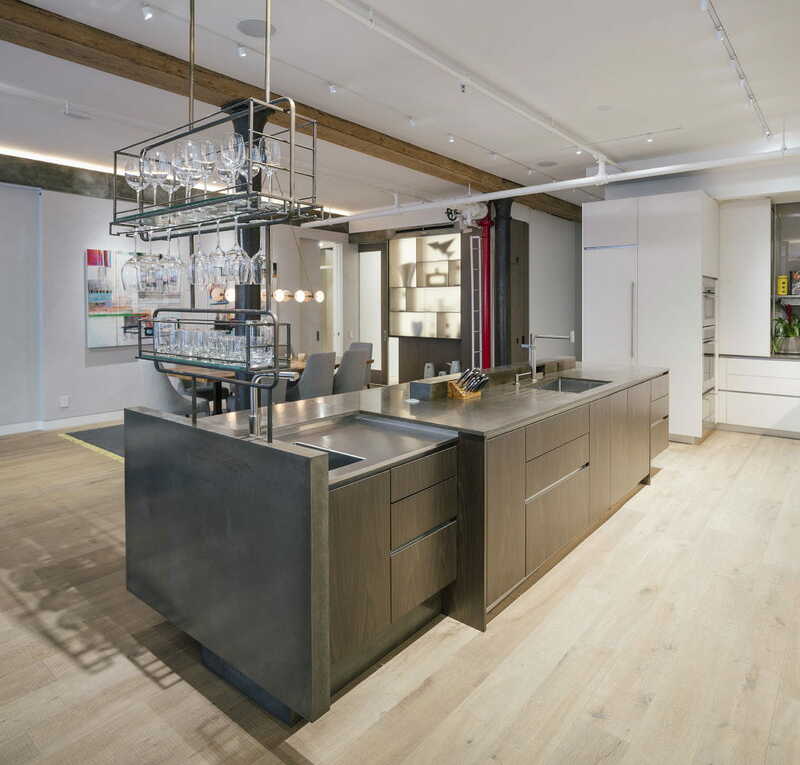 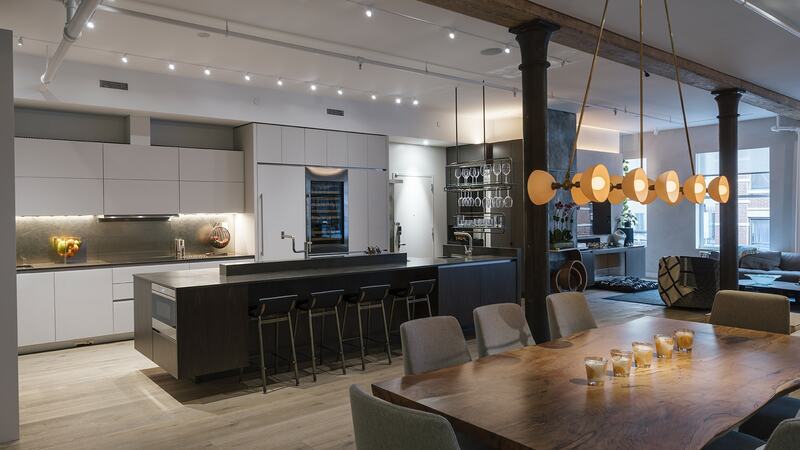 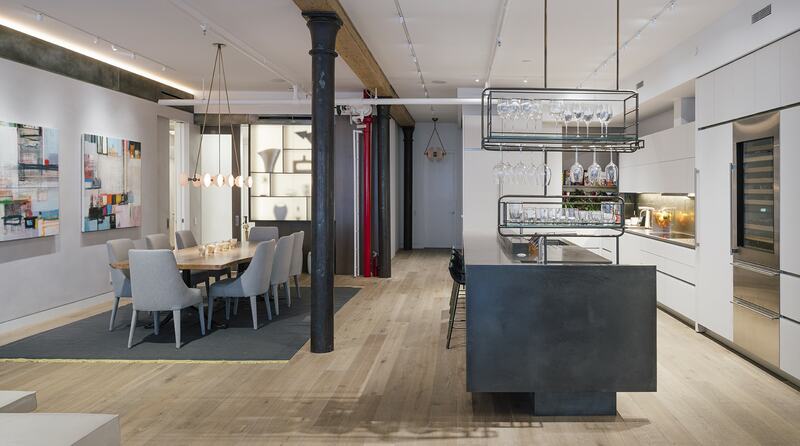 Exposed iron columns and wood beams run through this family residence located in Soho. 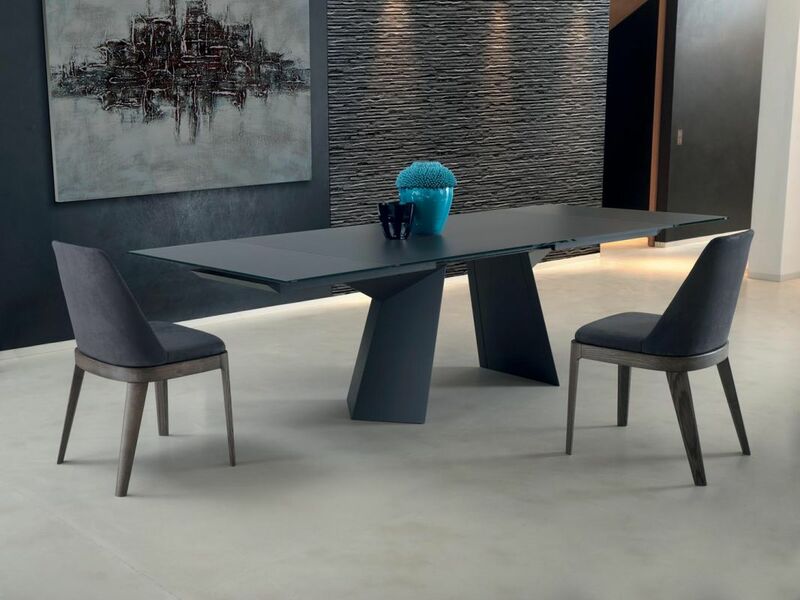 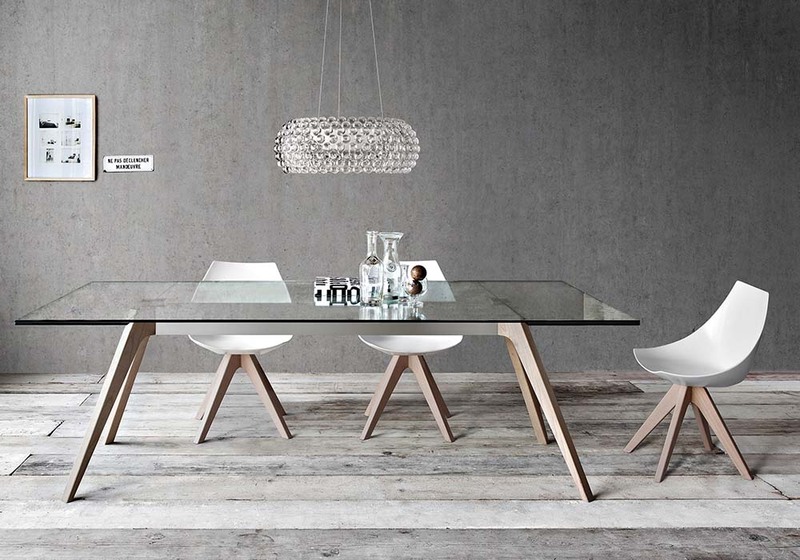 A large dining table from a thick slab of oak, paired with a shiny dark cement island, custom-casted for space. 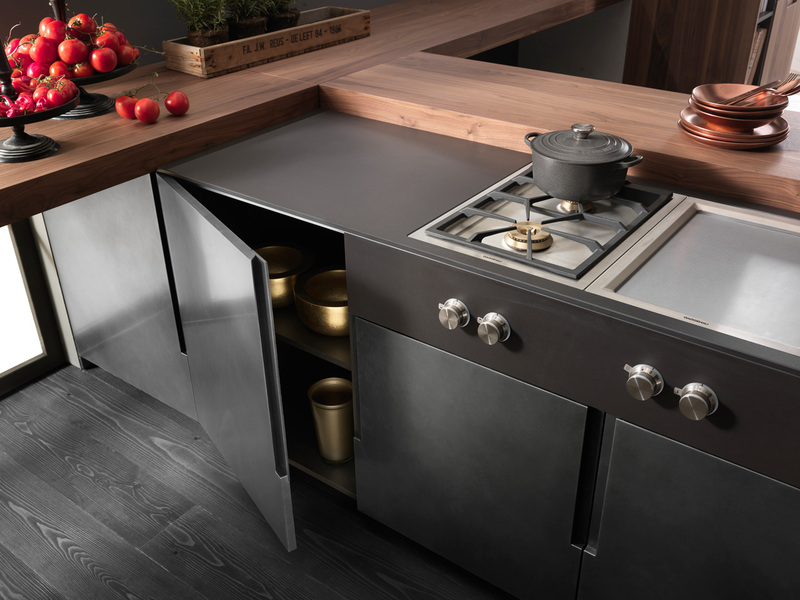 Reflecting on the character of the family, the island is an all-in-one device for cooking and hosting: two separated sinks for cooking and serving drinks, a built-in oven and a hanging glass tray that makes every daily routine much more efficient. 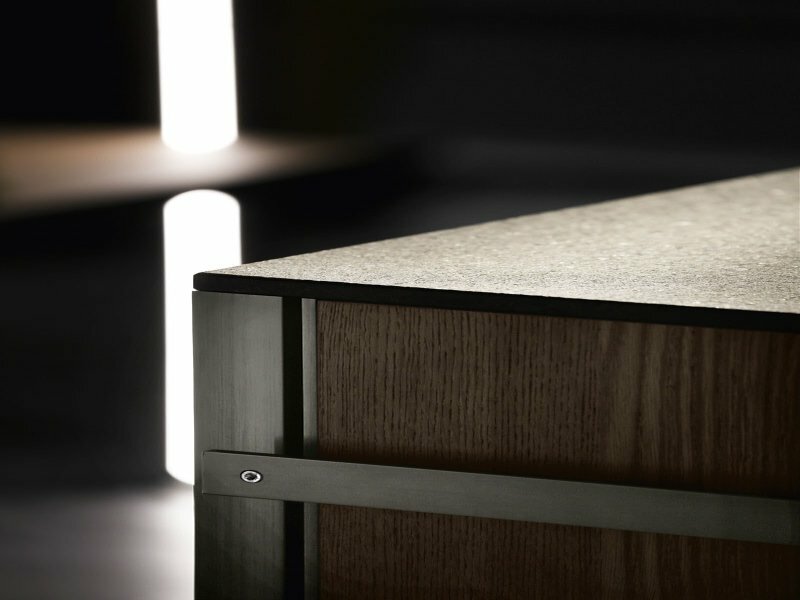 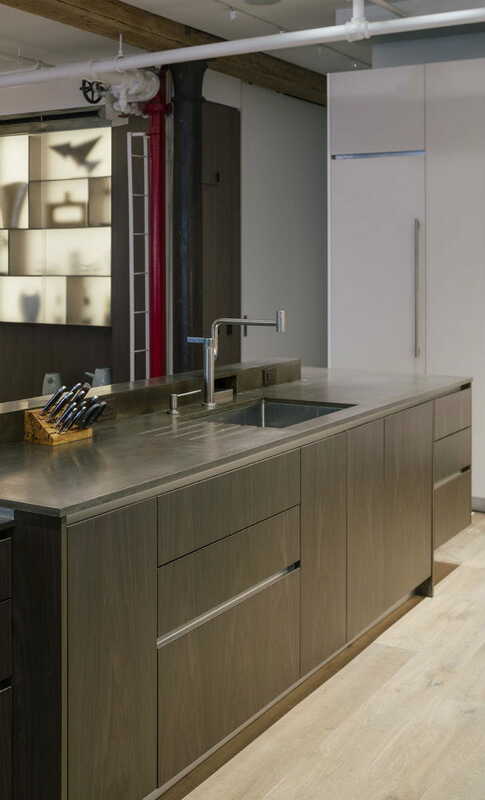 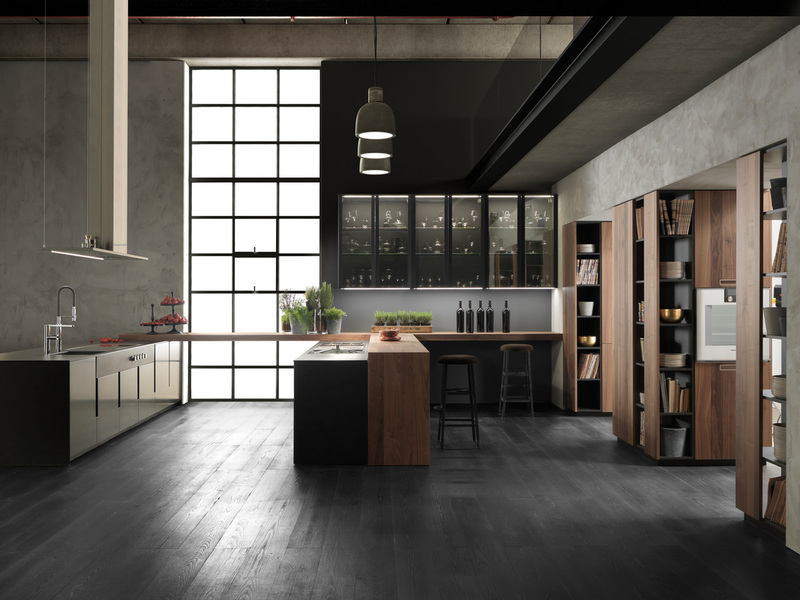 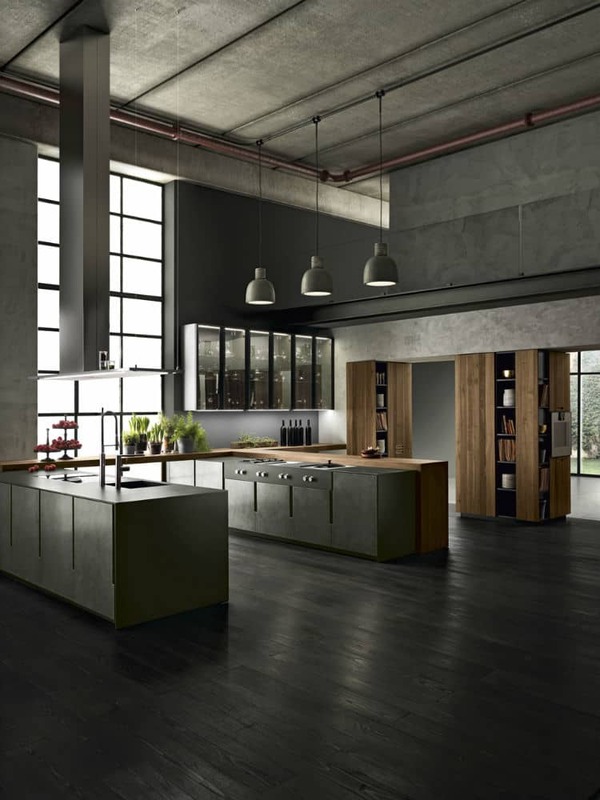 Steel and fumed oak veneer complemented with the dark grey concrete to create a furniture-like character of this piece of the kitchen. 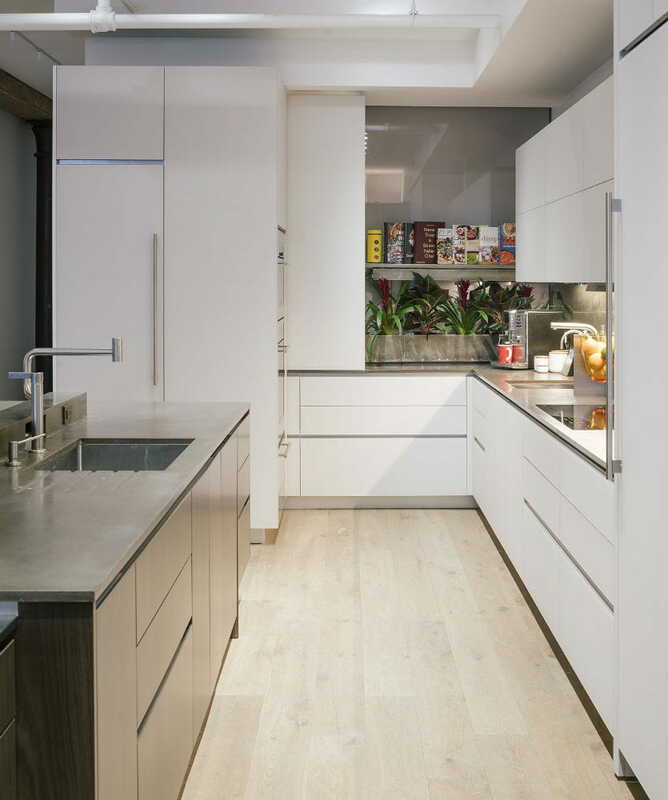 In the dining side, a thin layer of concrete spans was added over the cabinet blocks. 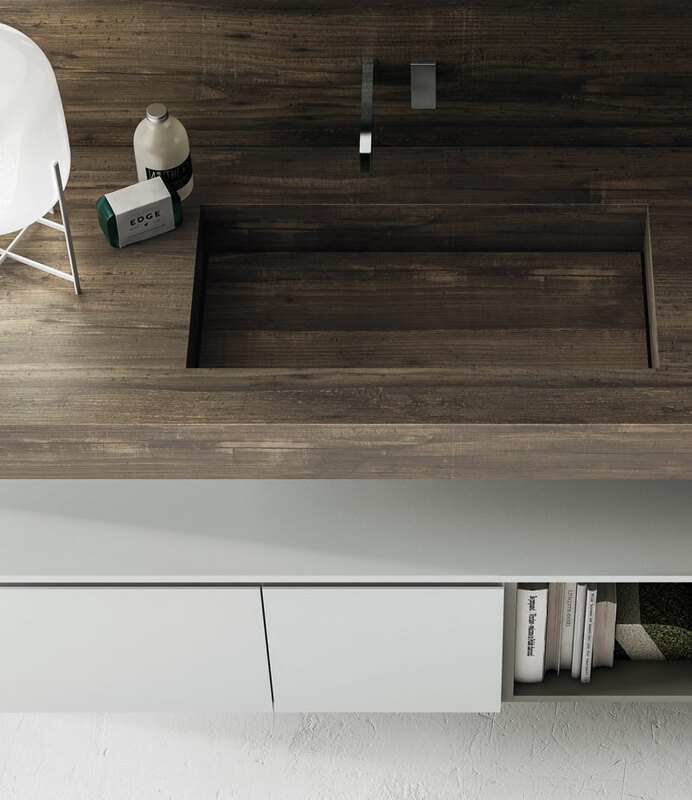 In order to create a functional space, compact storage was installed on neat Ikonni’s glass mate, attracting light into to the lofty space and underlines the geometry of the island. 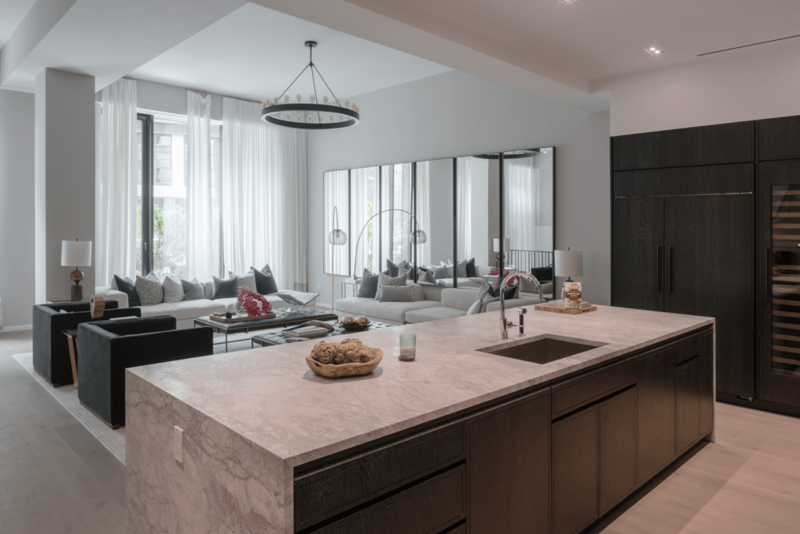 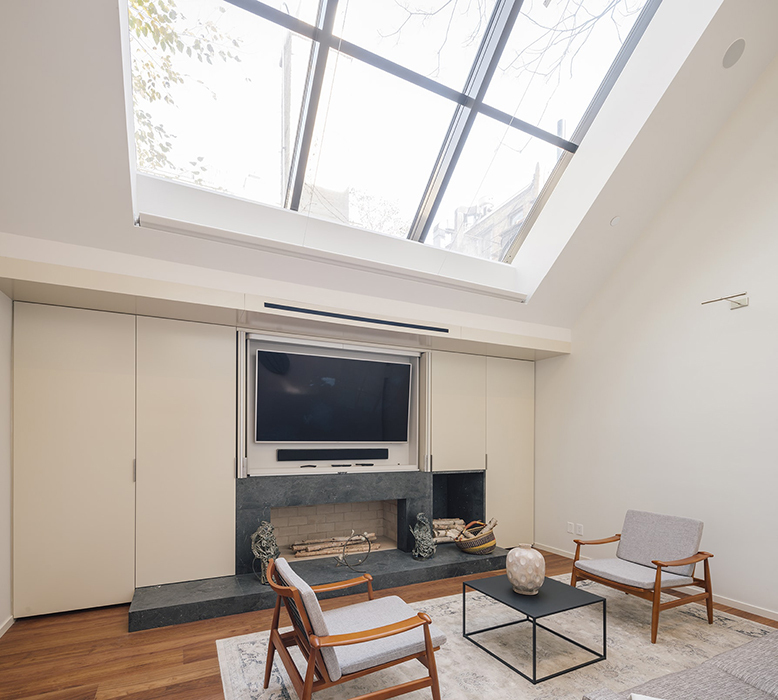 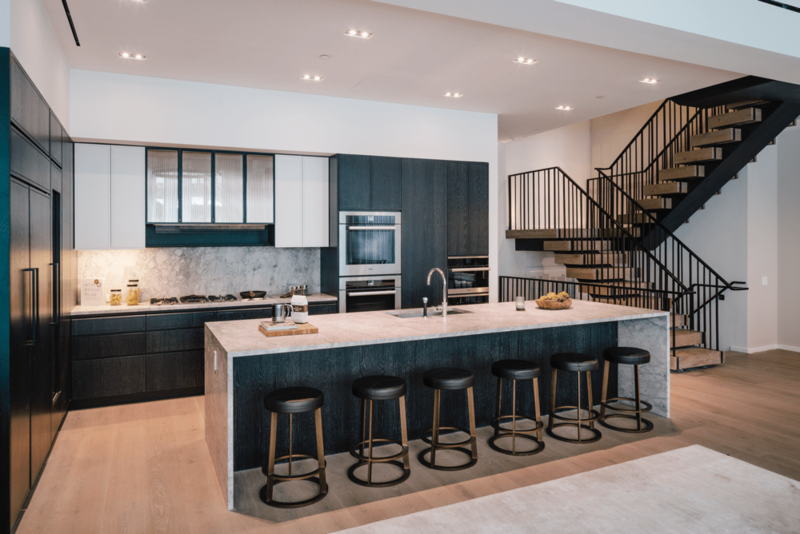 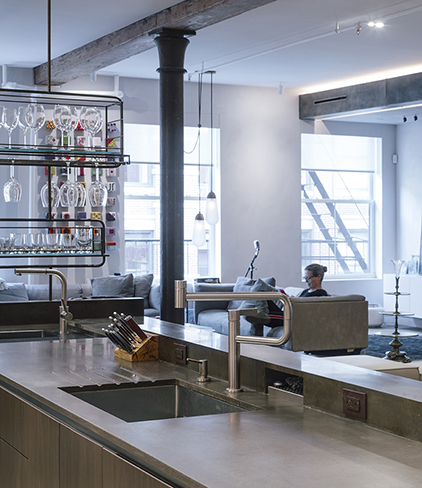 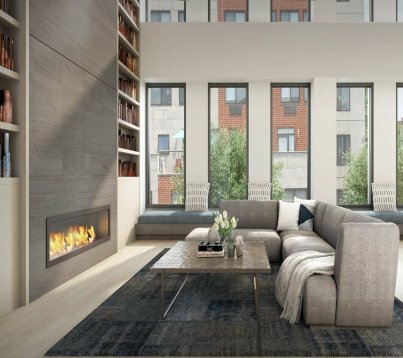 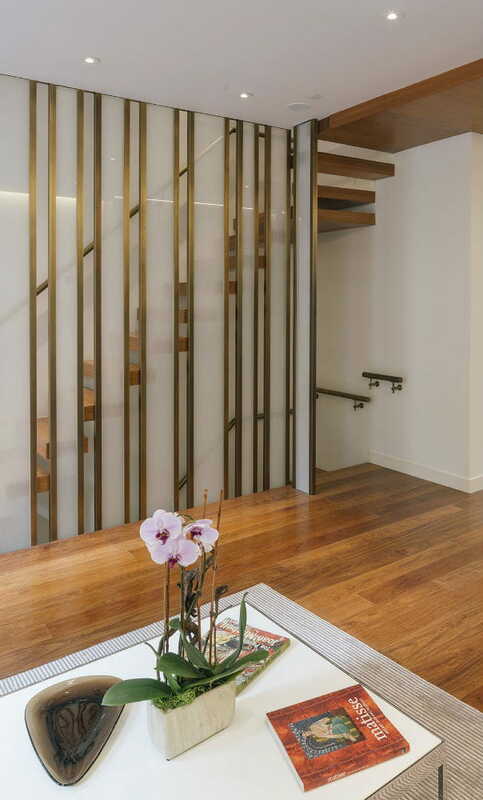 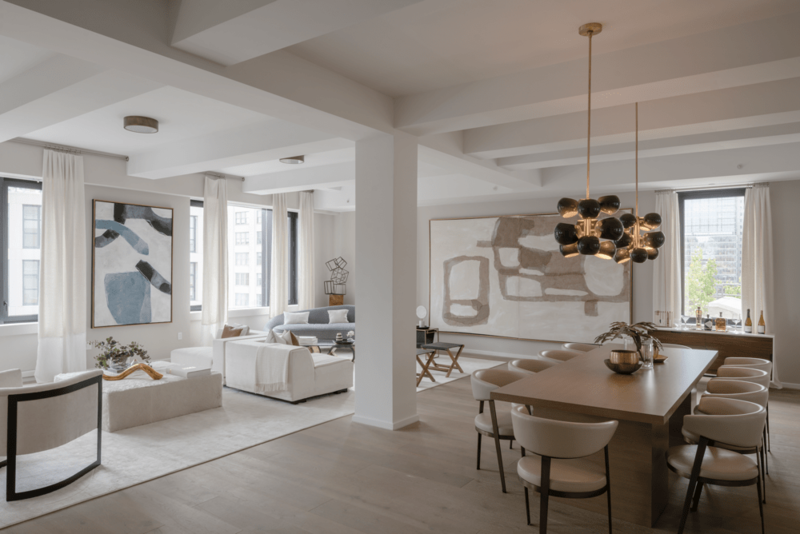 The interiors of the tribeca building conversion encompasses the combination of open loft living with the privacy of traditional residential design, united by a meticulous level of craftsmanship and material selections. 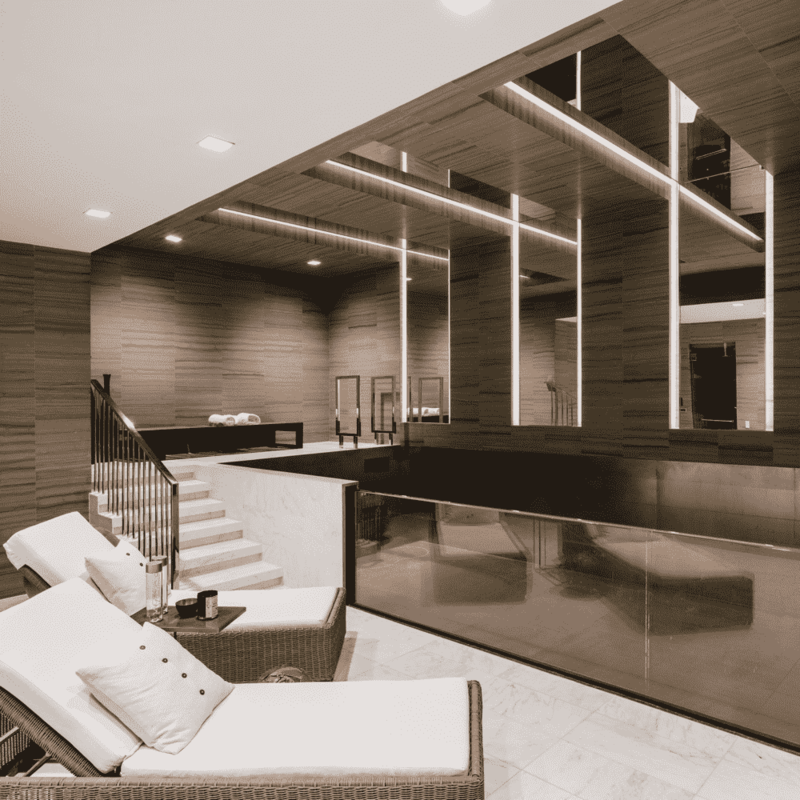 three triplex townhouses include a private spa on the lower level featuring steam rooms, saunas and 50 ft glass walled lap pools. 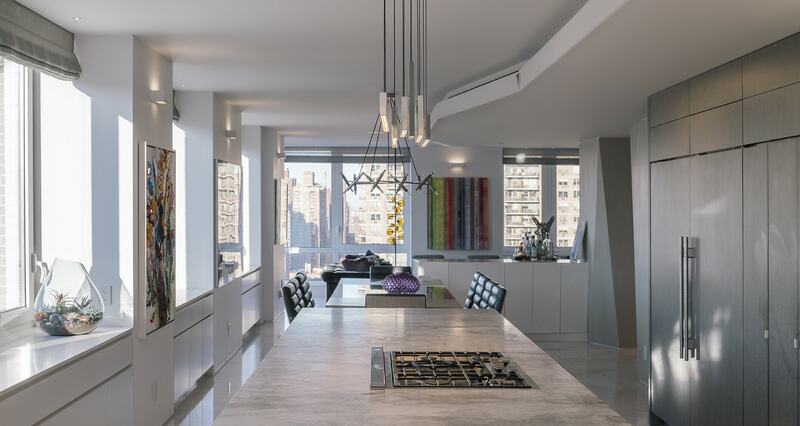 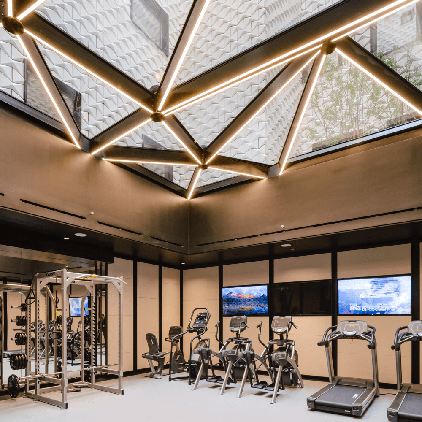 each residence is designed with private elevator access and expansive ceiling heights. 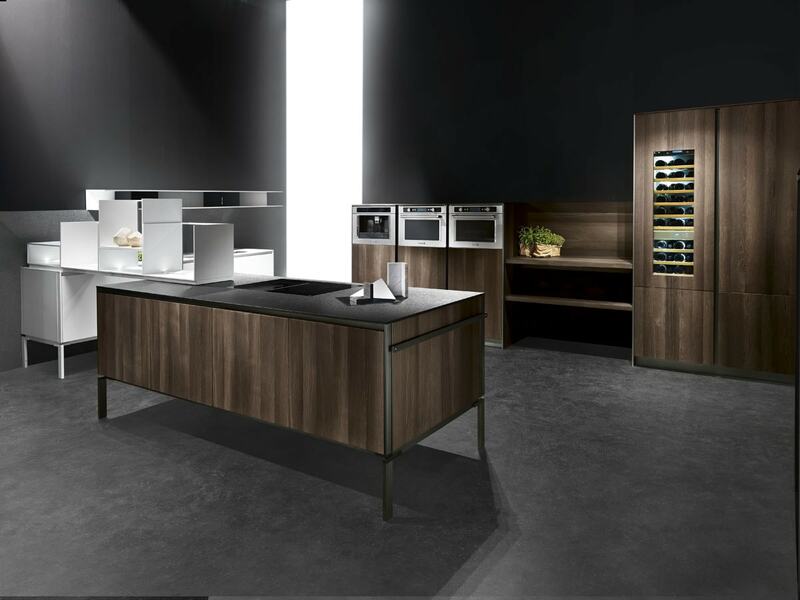 Vesta is the result of a simple design whose minimalist shapes conceal a high-tech design: the new aluminum frame is the centerpiece of this model, supporting material with resistance, and hob Empathy, which reveals a new and unique induction technology concept. 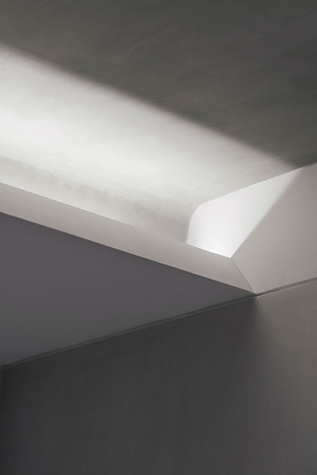 Boldness of changing can be the shell of the genius pearl: the intuition that provides pioneers with the right sense of direction, enforced by a strong traditional and by the capacity to be still amazed when something new, that was held as impossible, is born. 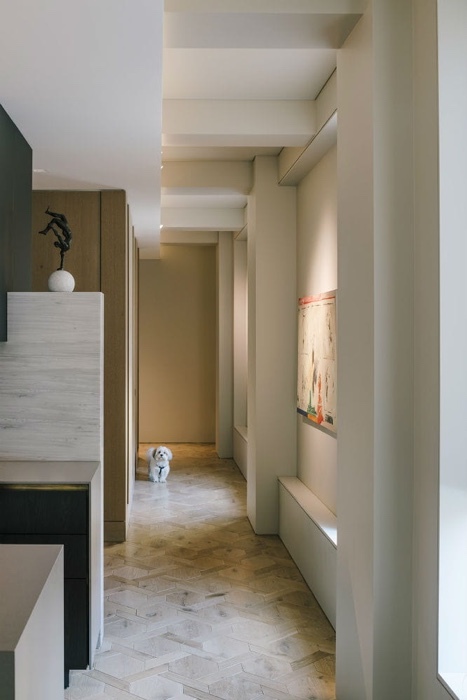 As humans grow up, the distance between their footsteps becomes wider. 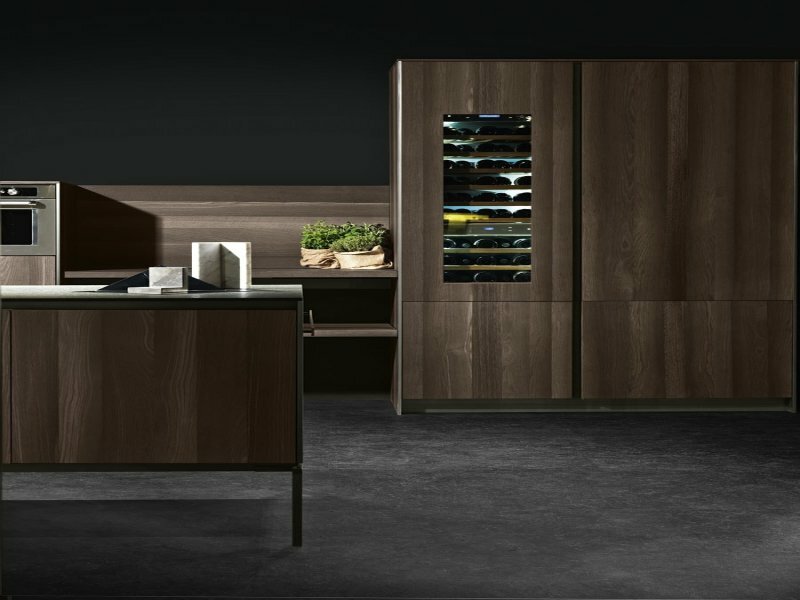 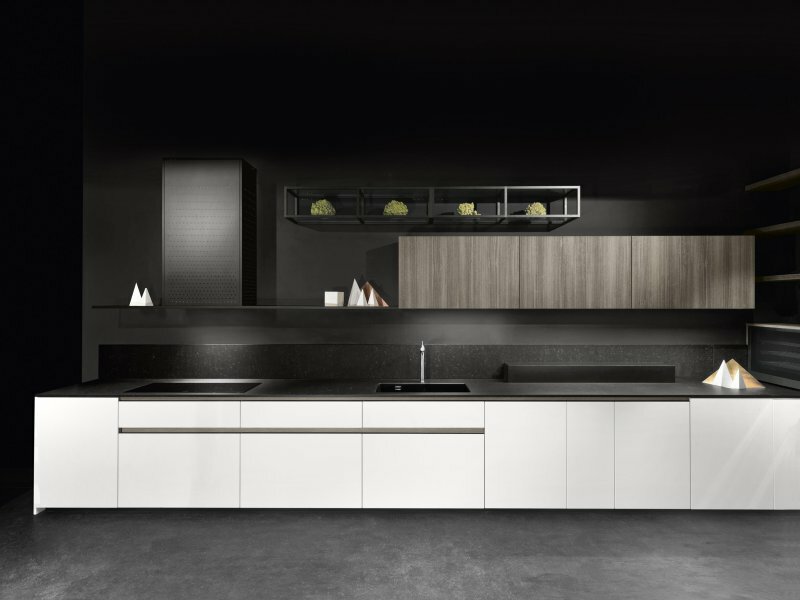 The same happens to Regula, born in 1998, which has developed to the current new aluminium frame that allows to set the supporting legs to the edges of the kitchen, without any intermediate step. 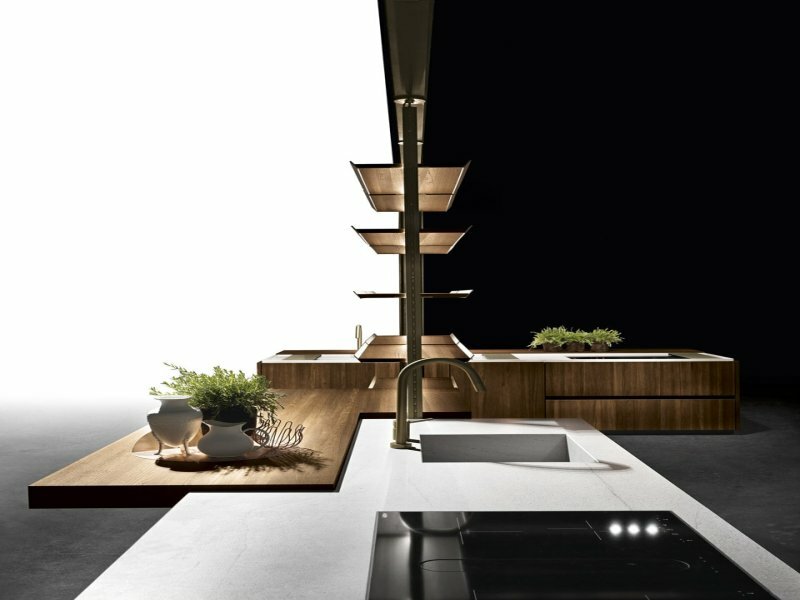 Mantis is an incorporated architecture project representing the evolution of technology and space concepts, as space itself is an extension of time and using capability. 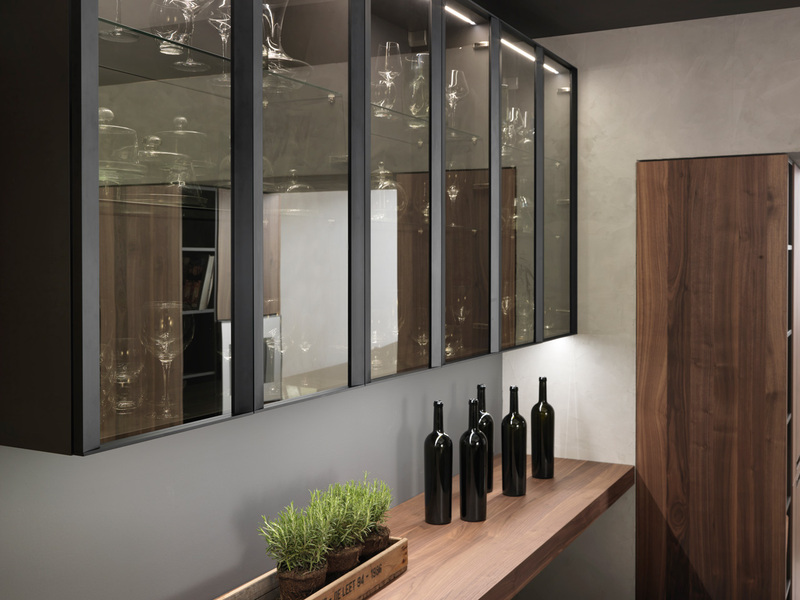 We create continuity between day and night, changing the meaning of the walls: from a division component to a completely passage element. 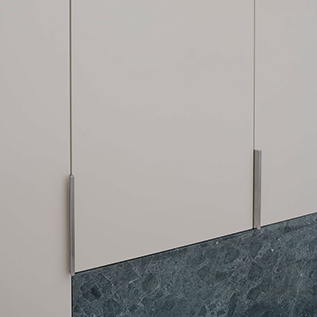 The union of polar concepts is the key to read the tall frontals we have created thanks to the 12 millimeter thick aluminium doors. 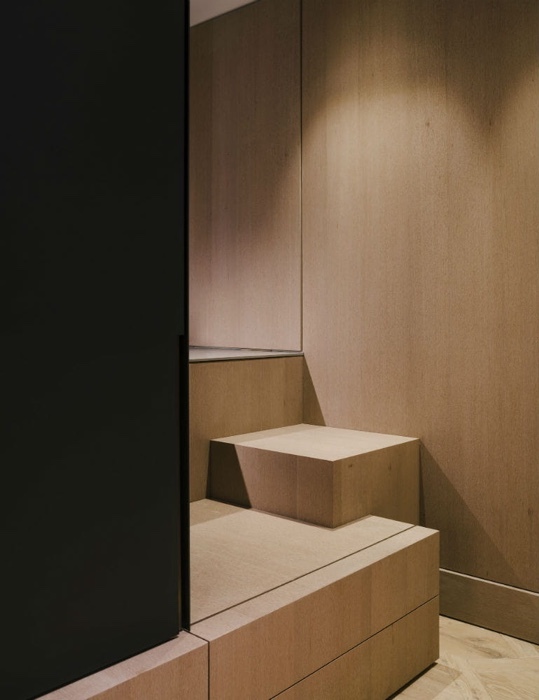 The vertical sign sets a constant pace on all the fronts. 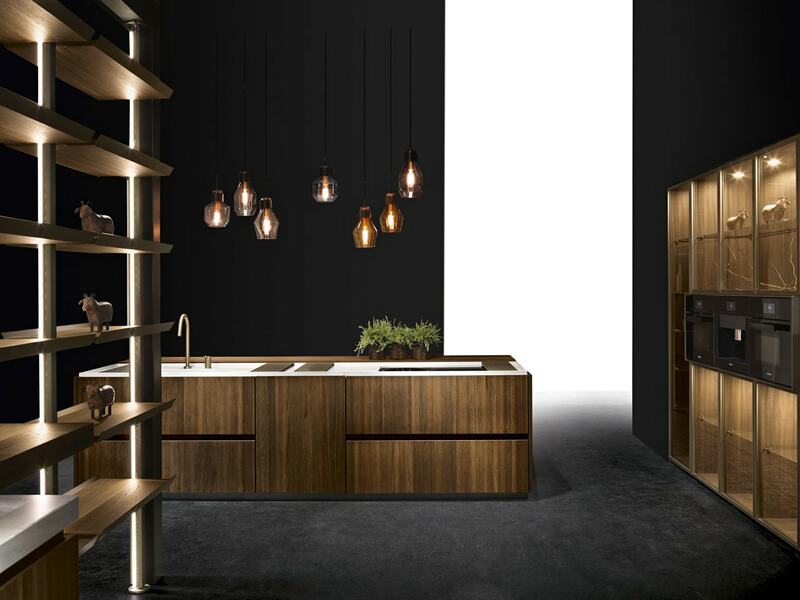 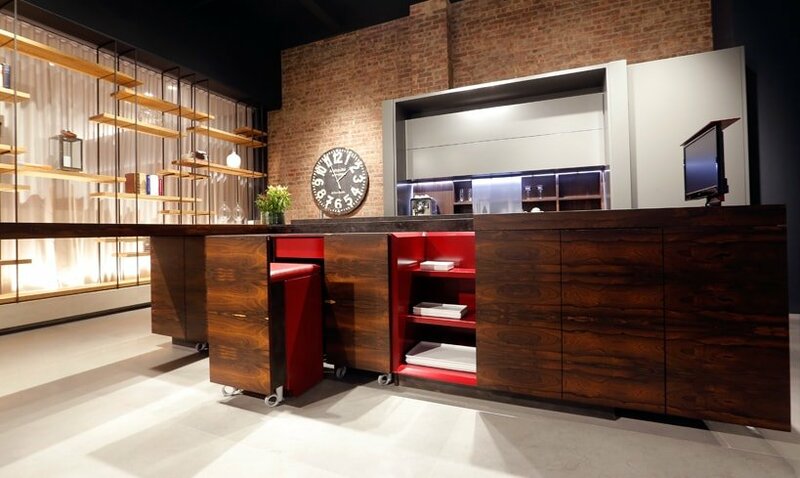 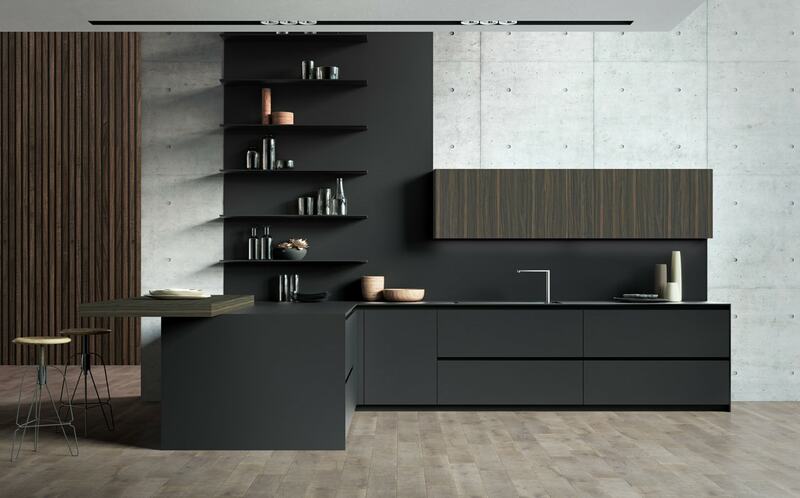 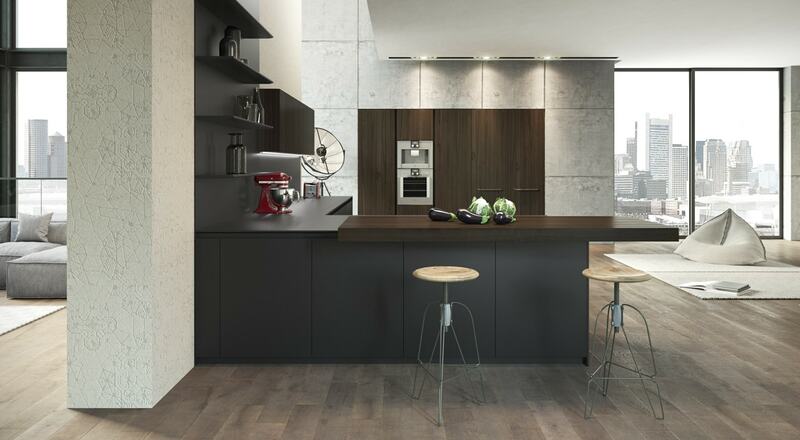 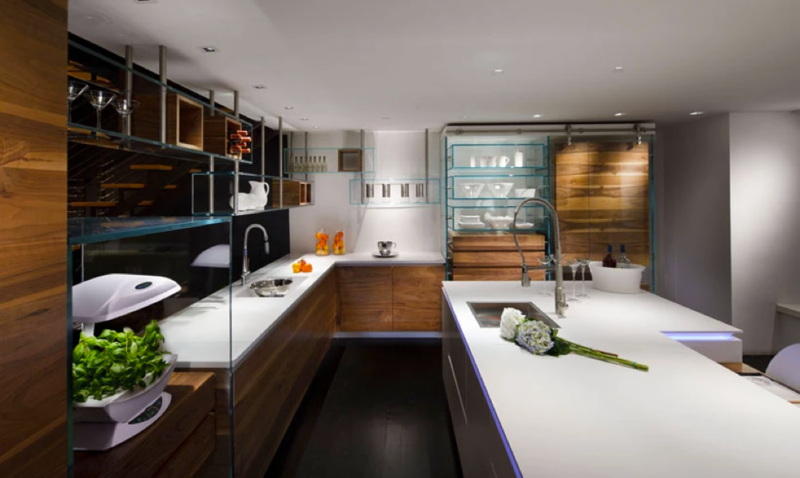 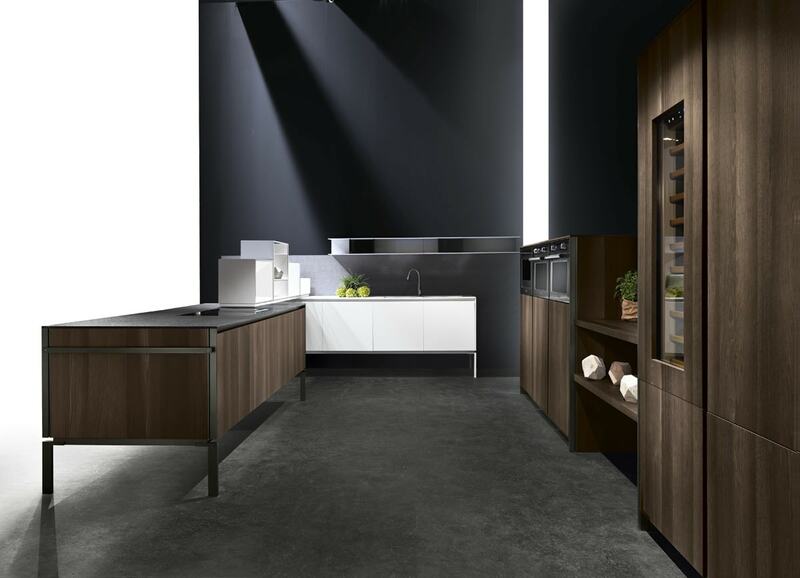 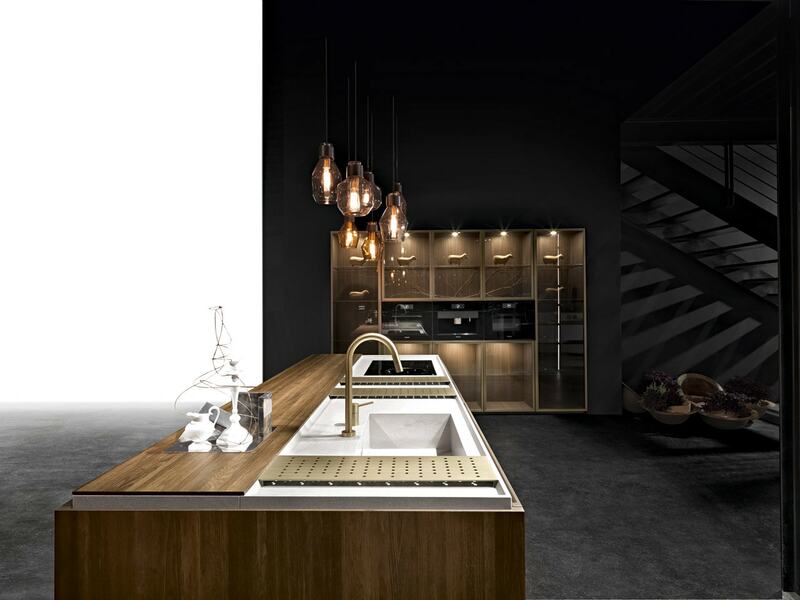 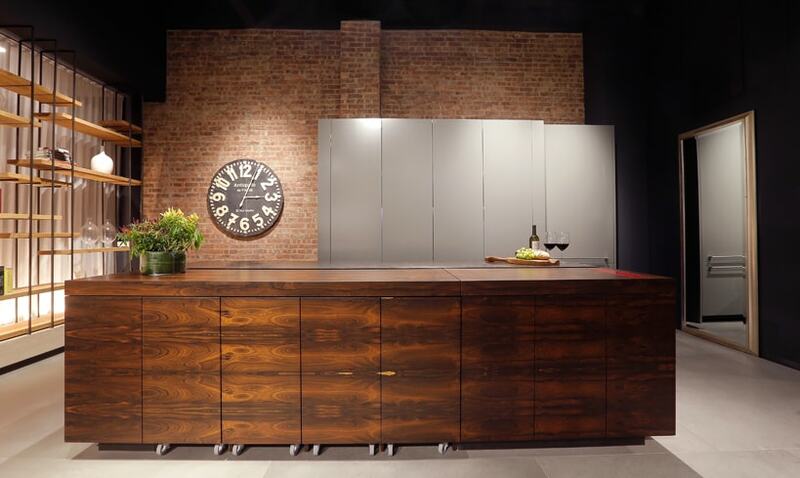 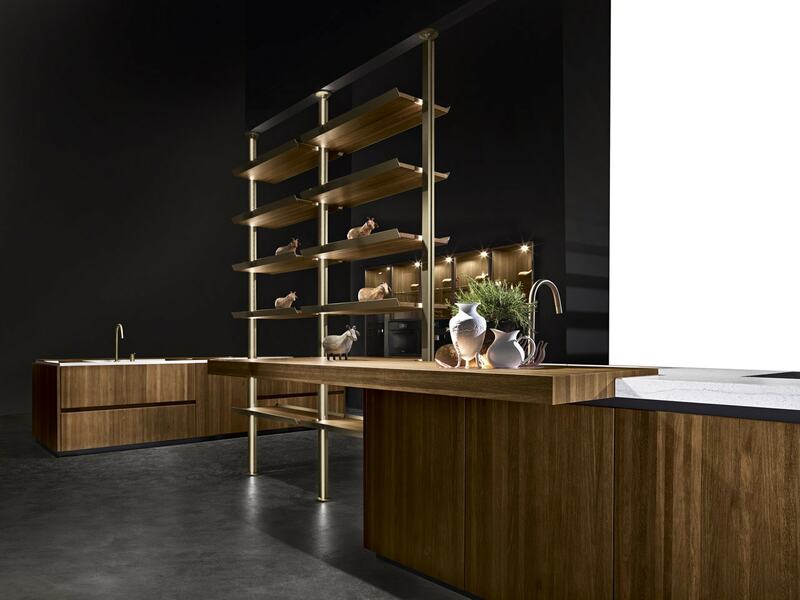 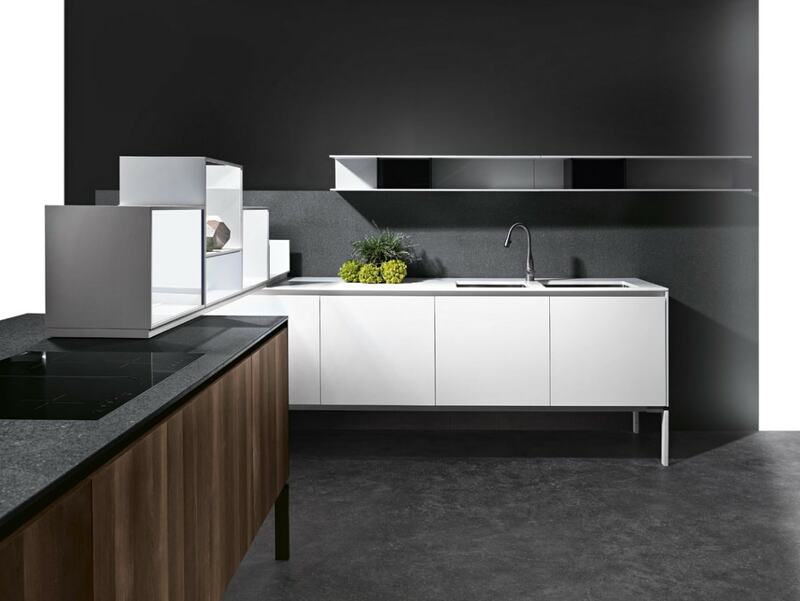 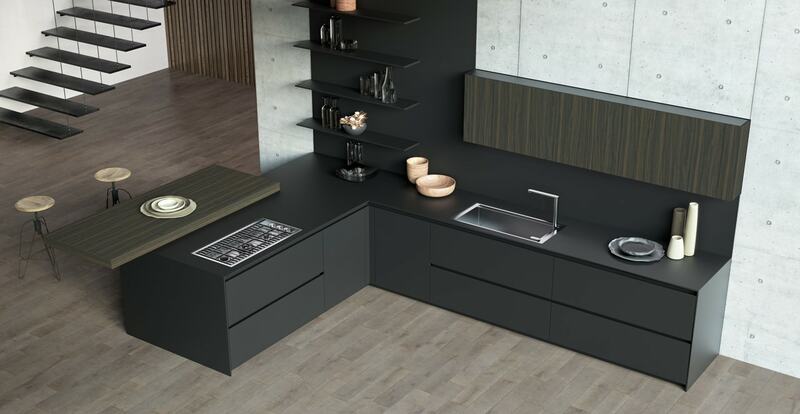 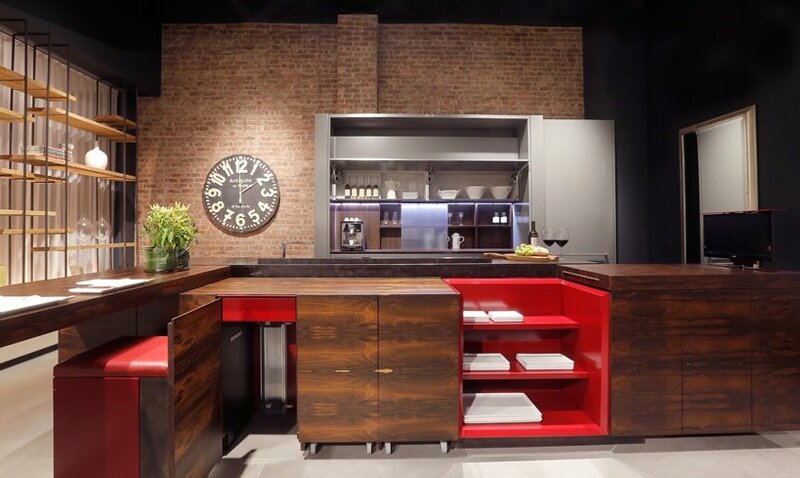 The sliding worktop, together with the wooden bins, create new dynamics of life. 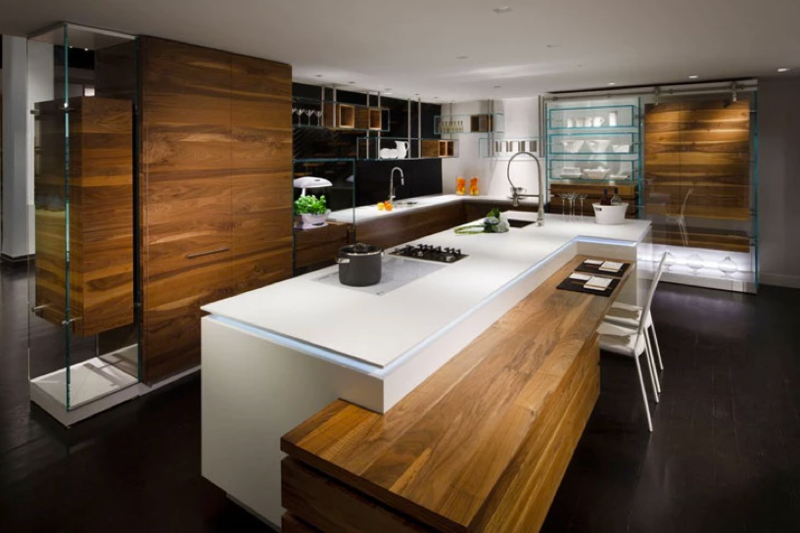 Technology contains technology, thus losing its purely stage value, creating a stronger relation with the adjacent area of the kitchen. 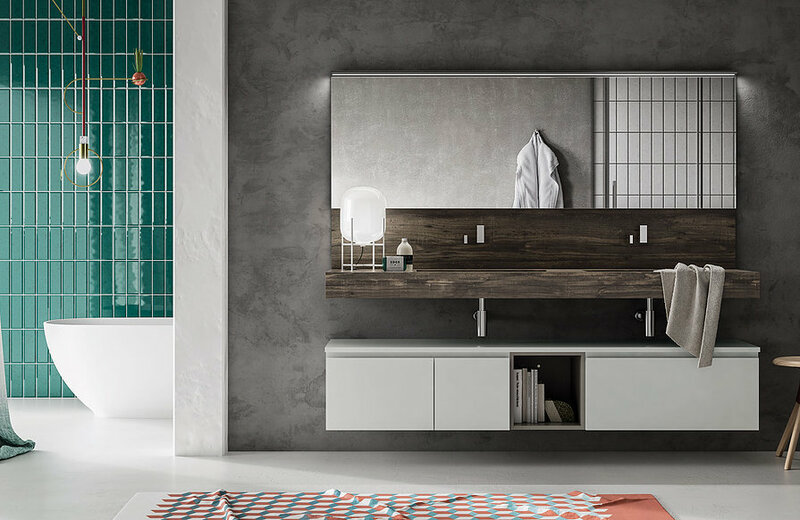 Modular configurations, laid against the wall or arranged as an island, are placed with grace and simplicity, returning the scene to the person who lives in it as the central focus. 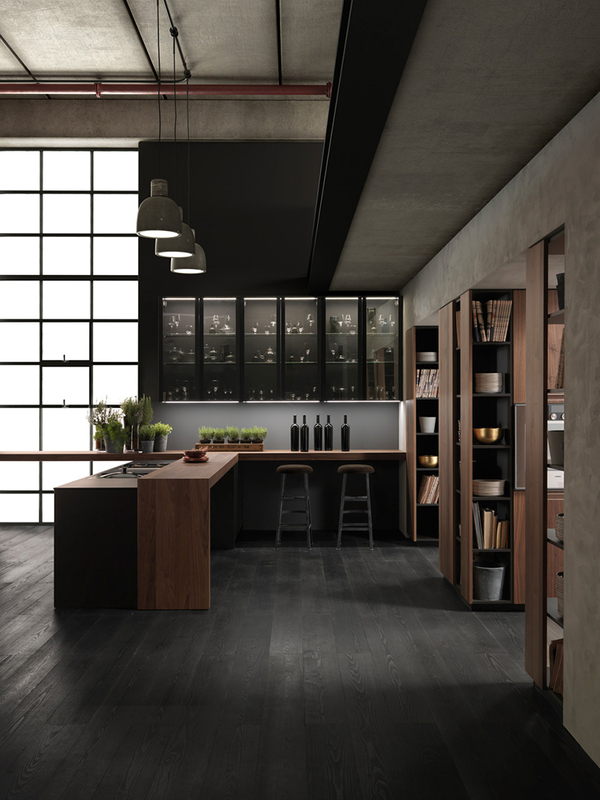 The space maintains a formal purity and intangible lightness where one can deftly move around amidst taste, flavours and the senses. 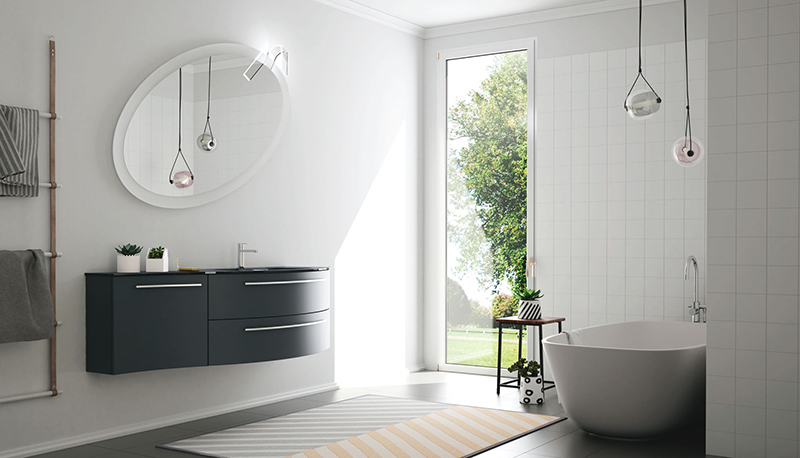 The arrangement in this room is built around a compact bathroom furniture solution with plenty of storage – featuring a cupboard with a door as well as a set of drawers, all fitted with handles in the satin finish – a glass countertop in the basalt grey lacquered finish 7012 with integral basin and countertop-mounted tapware and, adding the finishing touch, an oval mirror with translucent border. 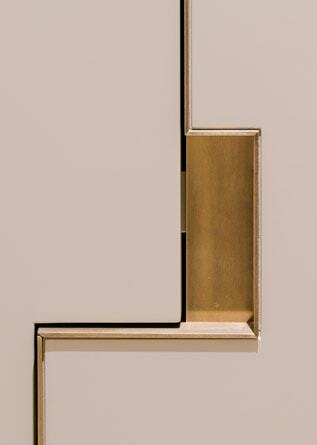 C-shaped elements wrap around rectangular forms. 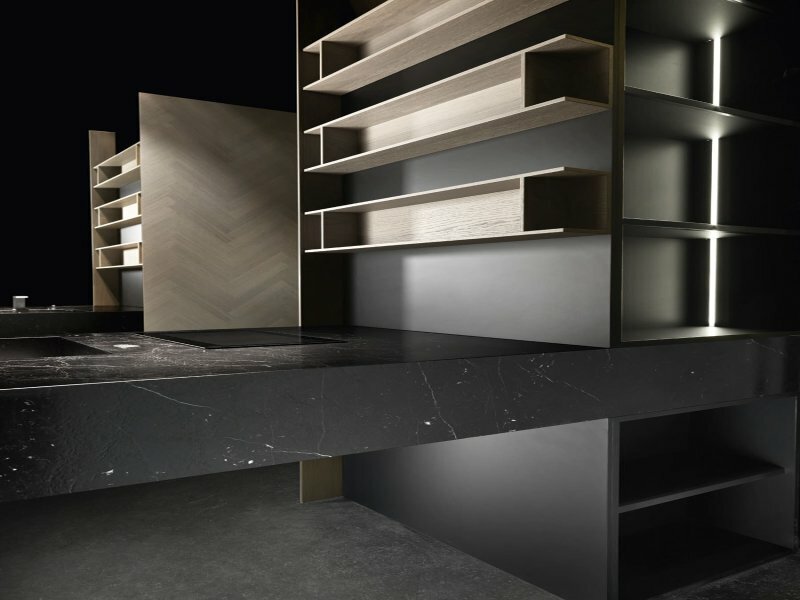 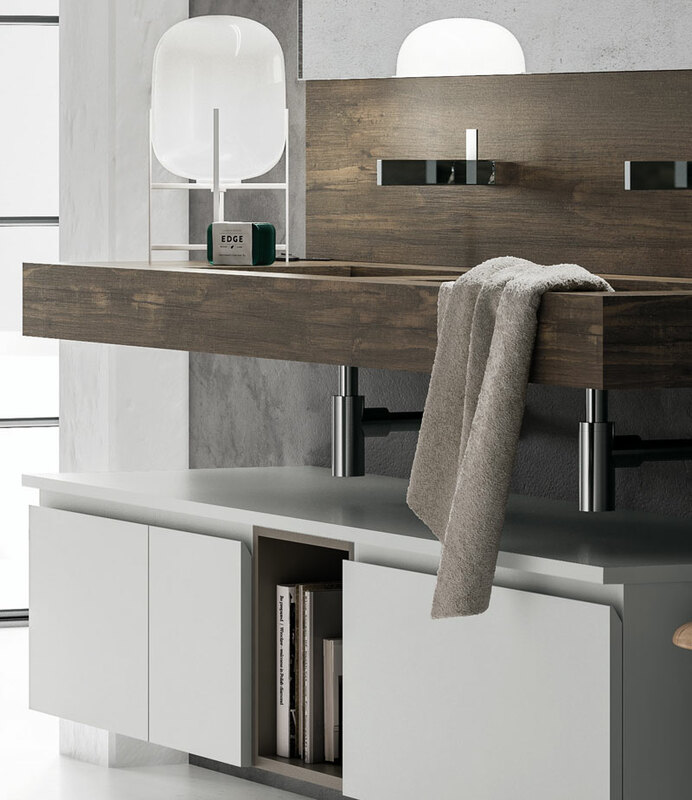 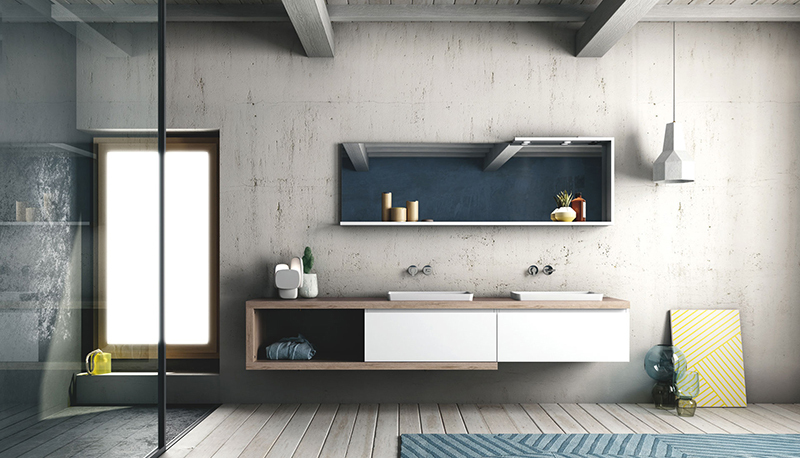 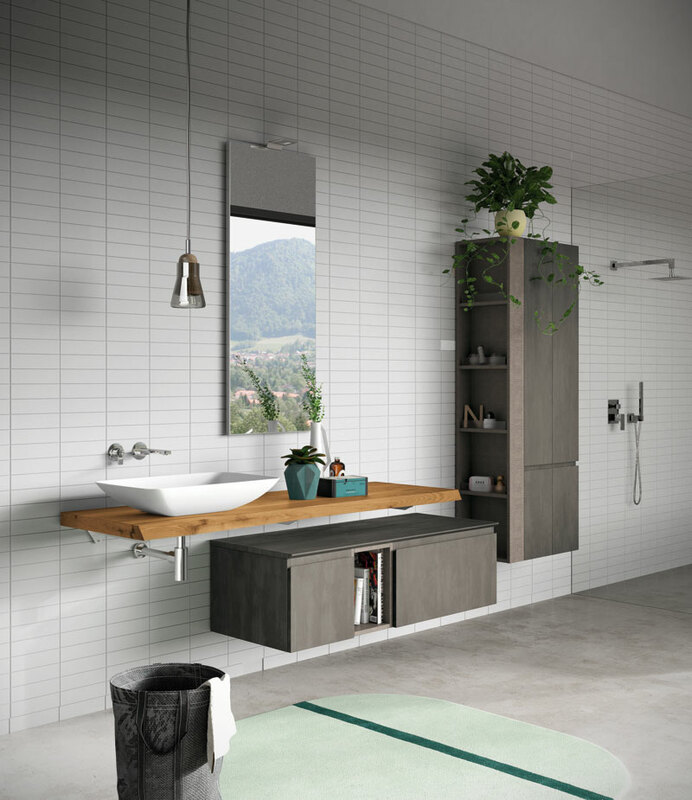 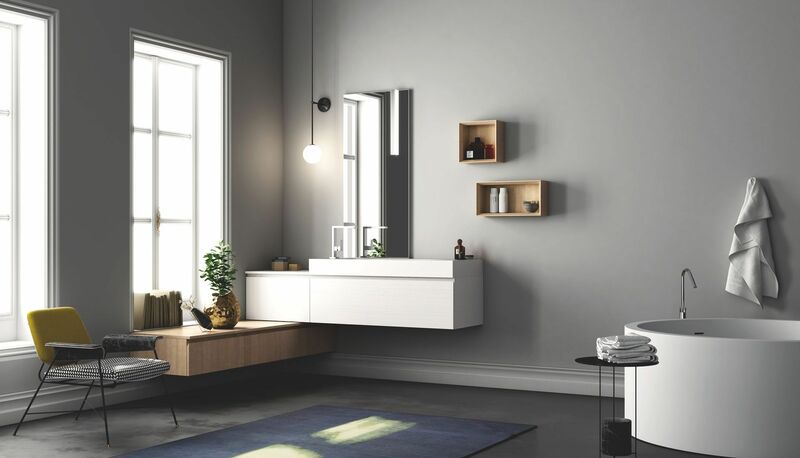 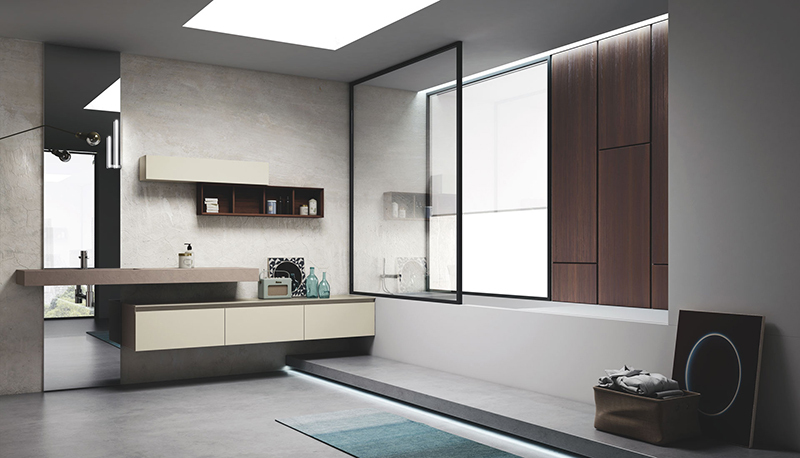 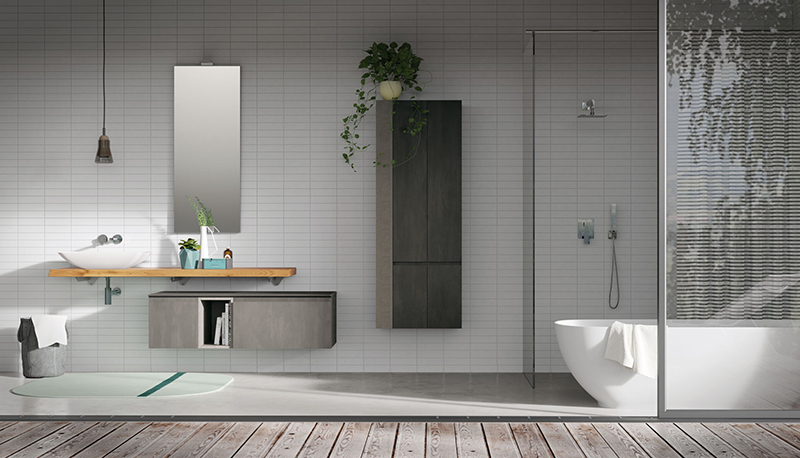 A treatment repeated both on the long mirror with shelf – virtually creating a frame with lighting built into the top – and the vanity with two generously sized deep drawers and open shelving. 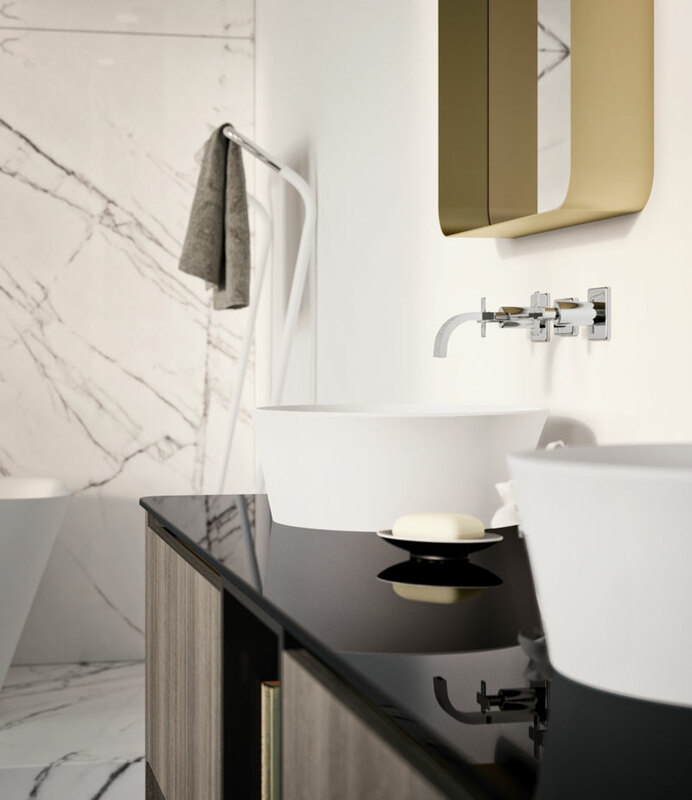 The twin-basin arrangement pictured is a convenient solution, with plenty of counter space, made visibly light by using semi-inset basins and wall-mounted tapware. 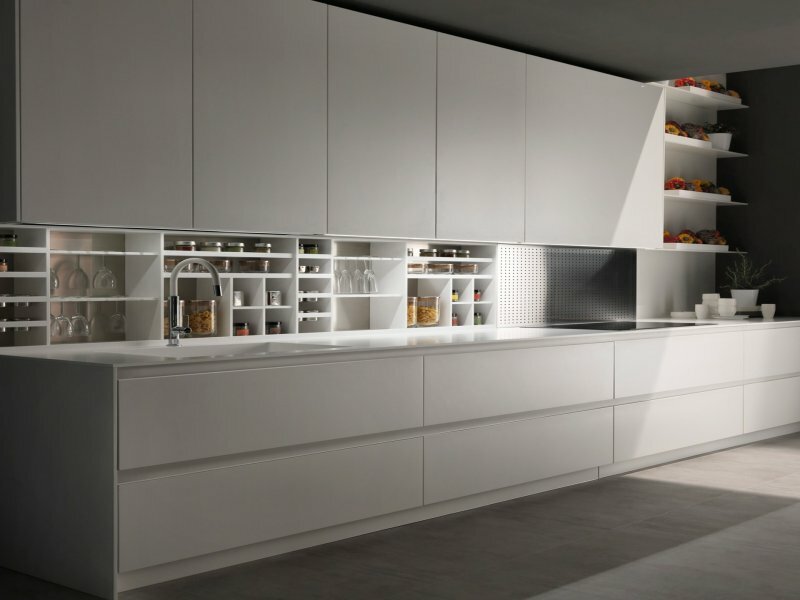 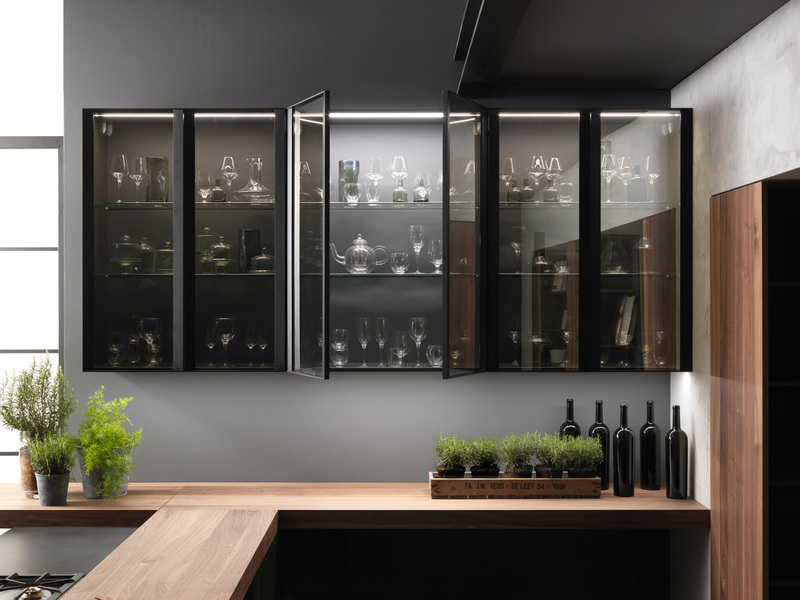 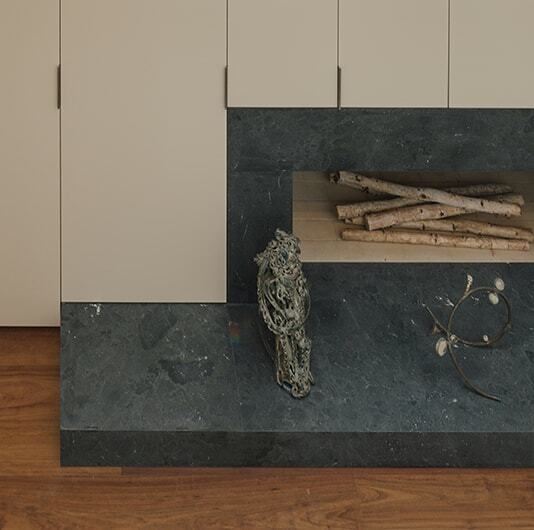 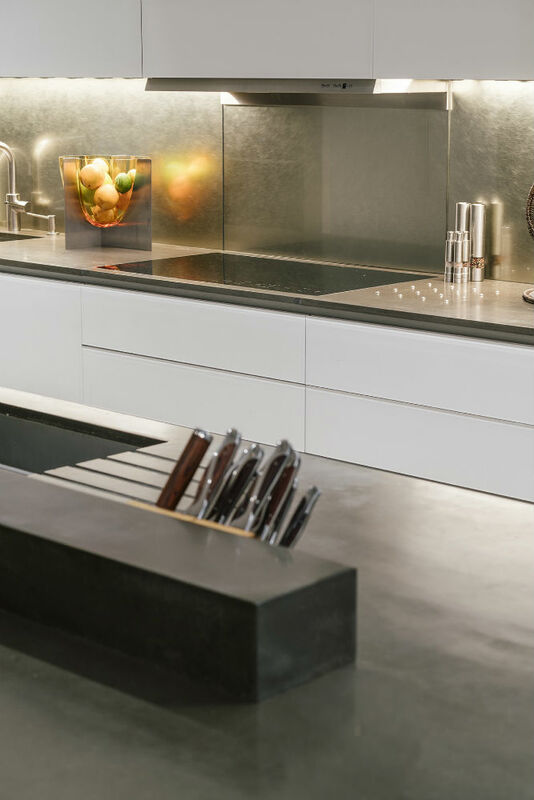 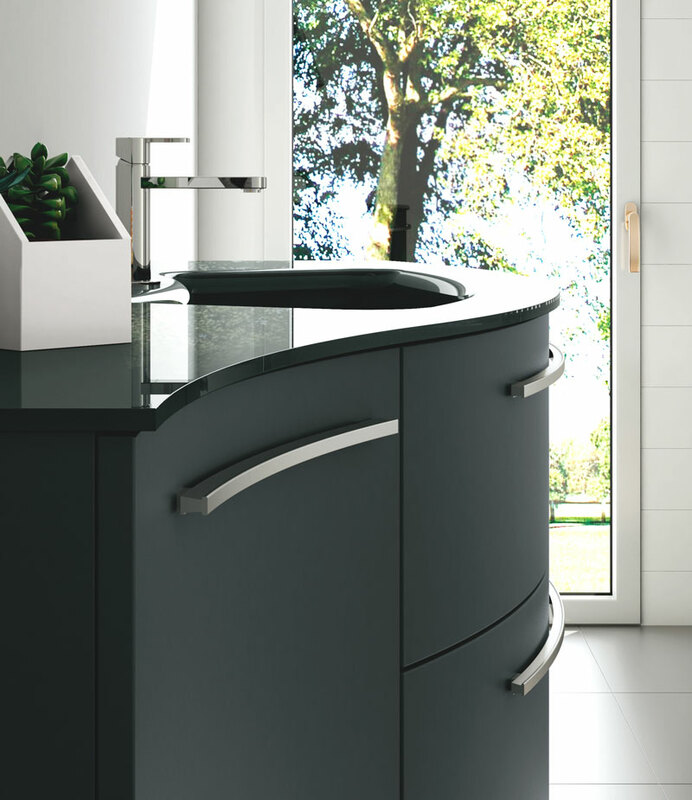 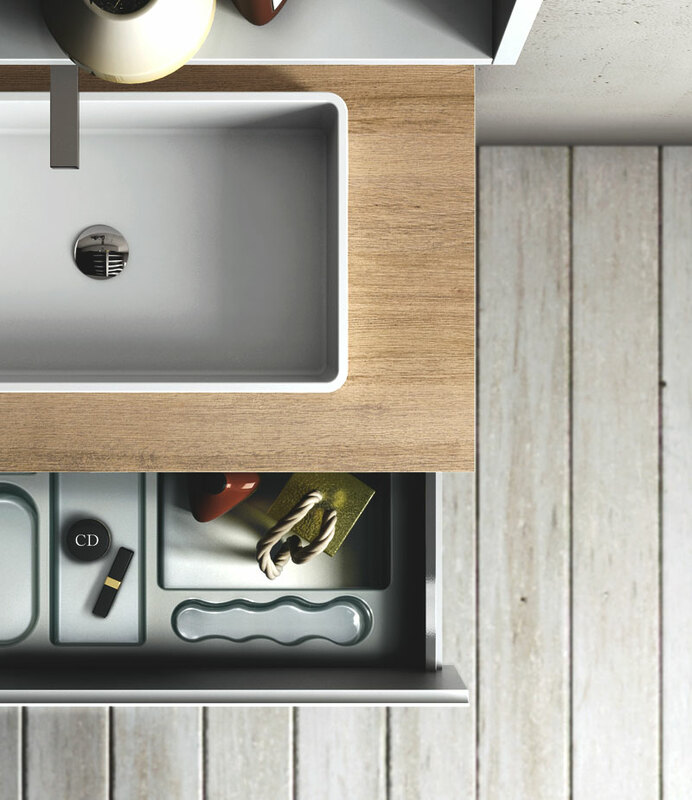 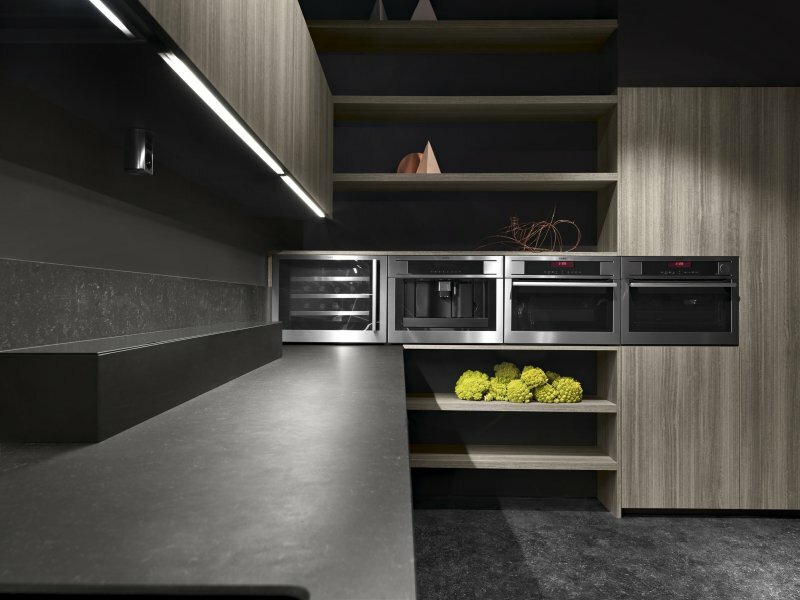 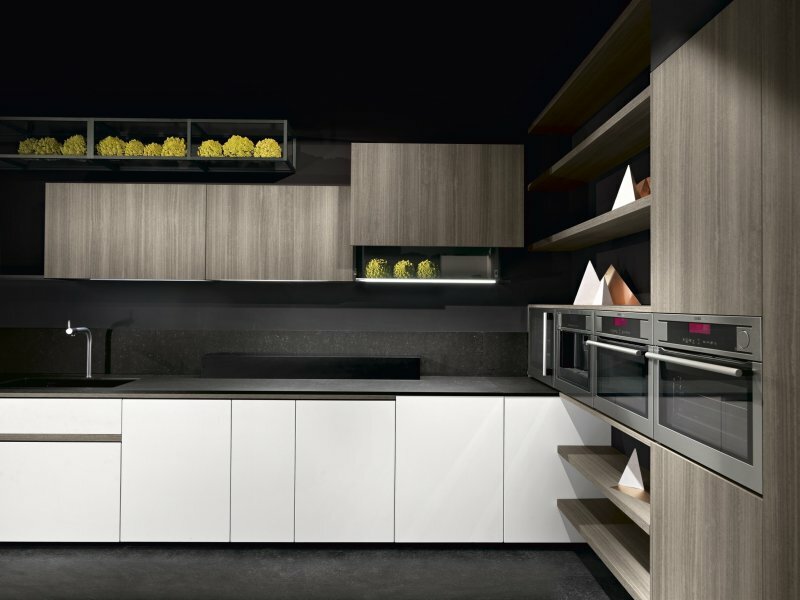 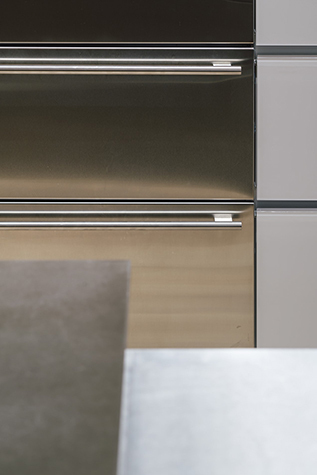 Linear, practical and functional composition designed to provide plenty of drawer storage as well as a significant amount of counter space for immediate, versatile use. 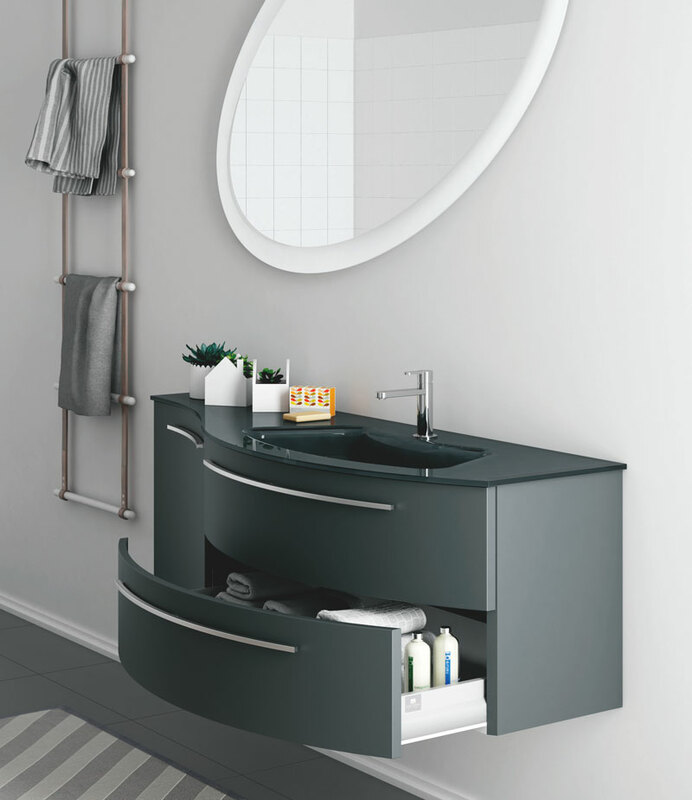 This bathroom furniture configuration extends horizontally to provide lots of room for setting down and stowing all your bits and bobs. 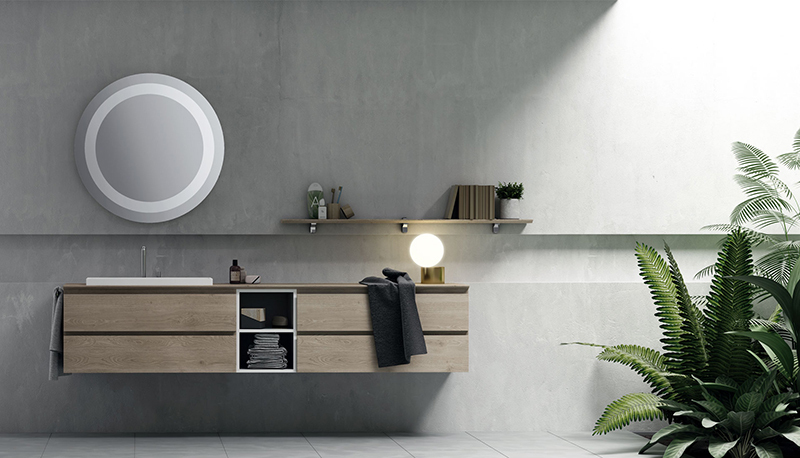 The extremely simple circular mirror is enriched with a ring of LED-lit opaline glass. 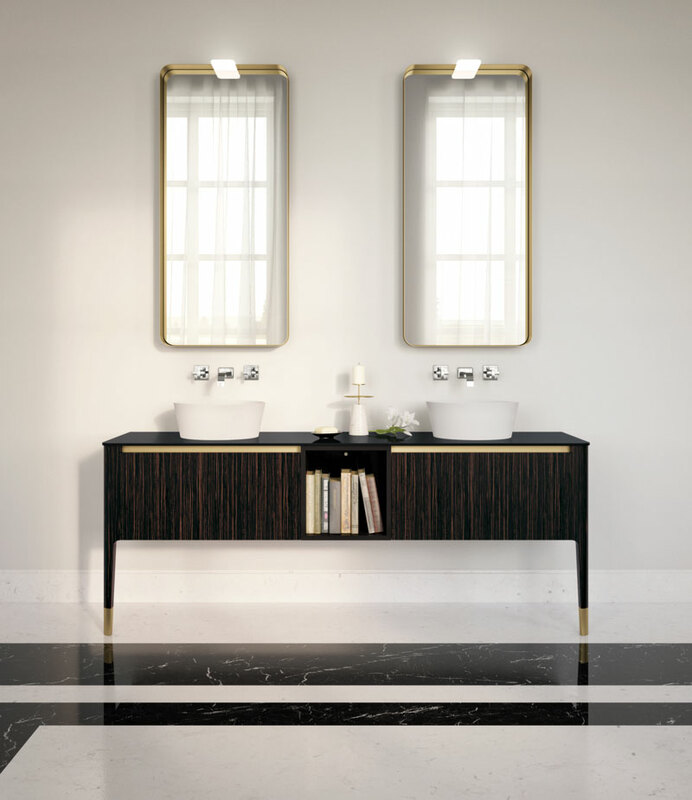 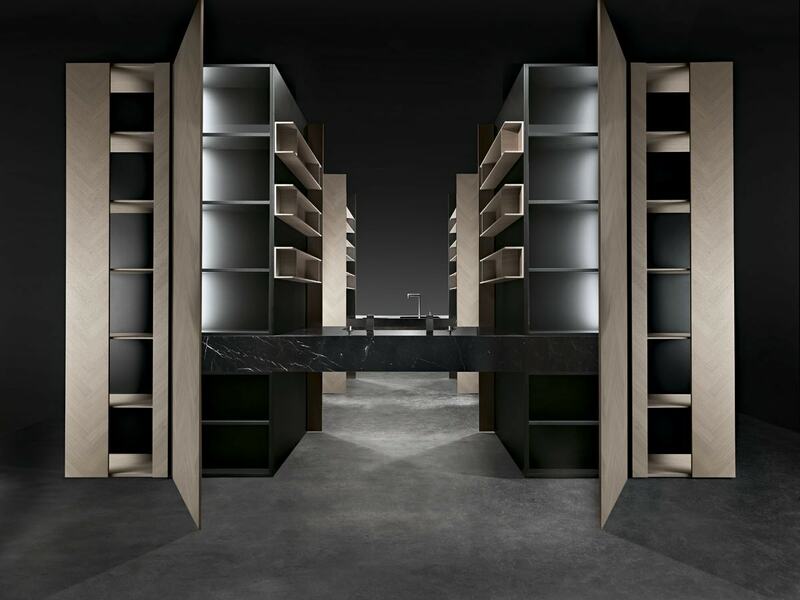 Designed for the master en-suite, this twin-basin, twin- mirror arrangement features perfect symmetry: the vanity’s open shelving is positioned right in the middle and features a Sablé Ascari laminate finish reproducing the look of eucalyptus wood and a black lacquered glass top. 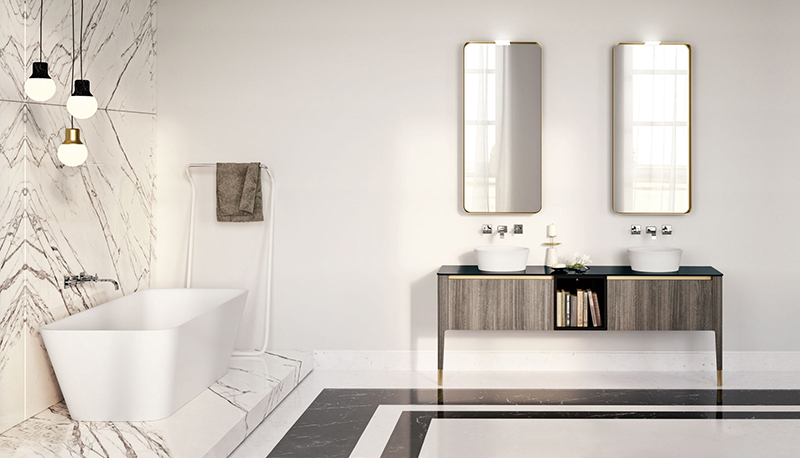 The two tall mirrors, produced exclusively for the Art catalogue, have a bronze-finish aluminium frame, matching the detailing on the vanity, as well as built-in LED lighting. 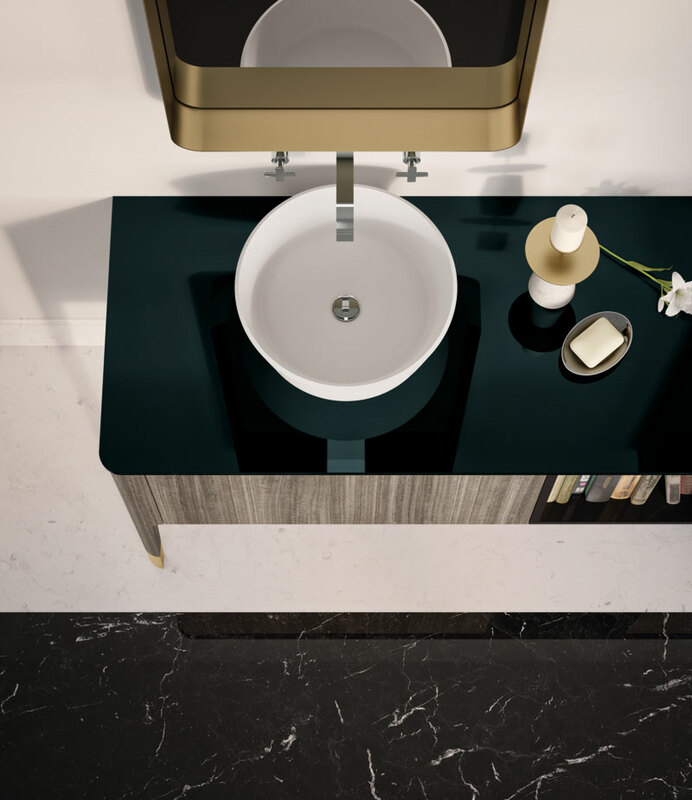 Both round bowl-shaped basins sit on the black lacquered glass top and are teamed with wall- mounted tapware. 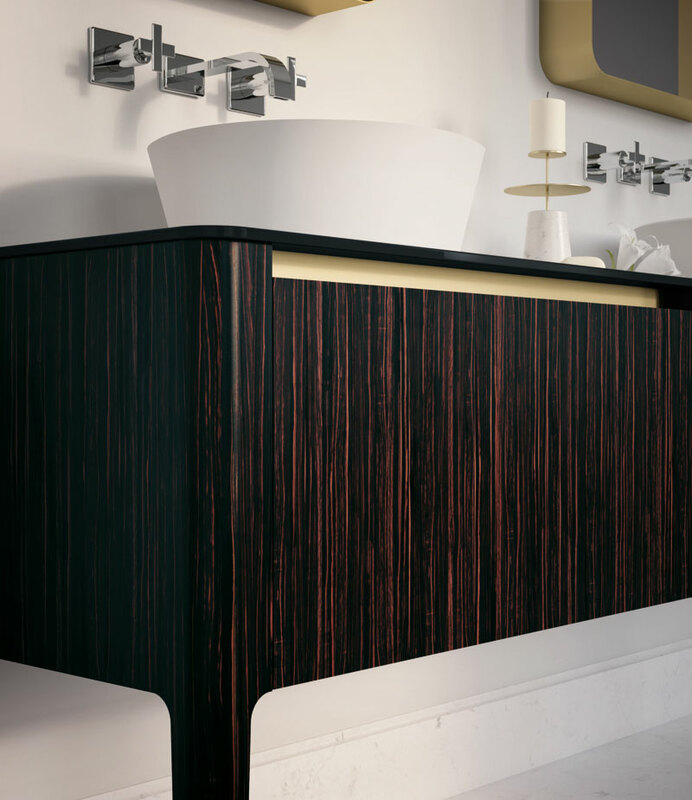 The arrangement is even more sumptuous with the vanity in the ebony version, again paired with the black lacquered glass top. 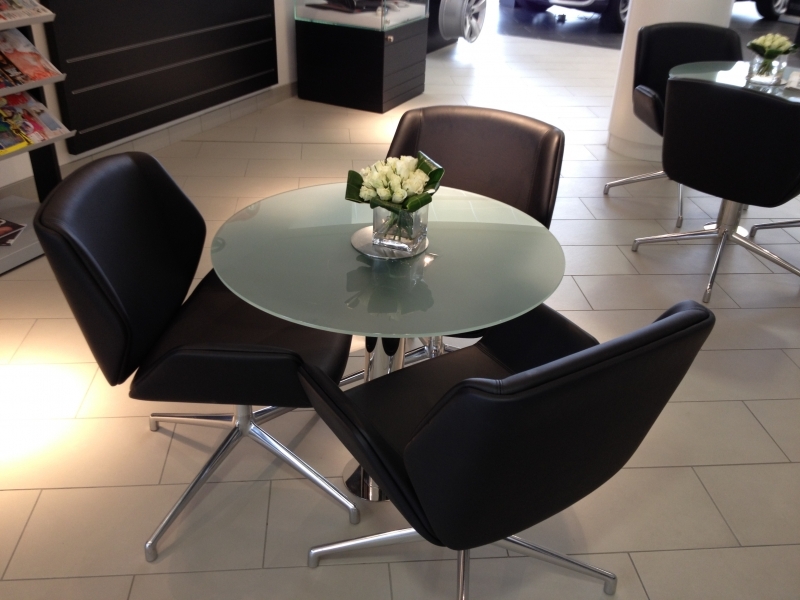 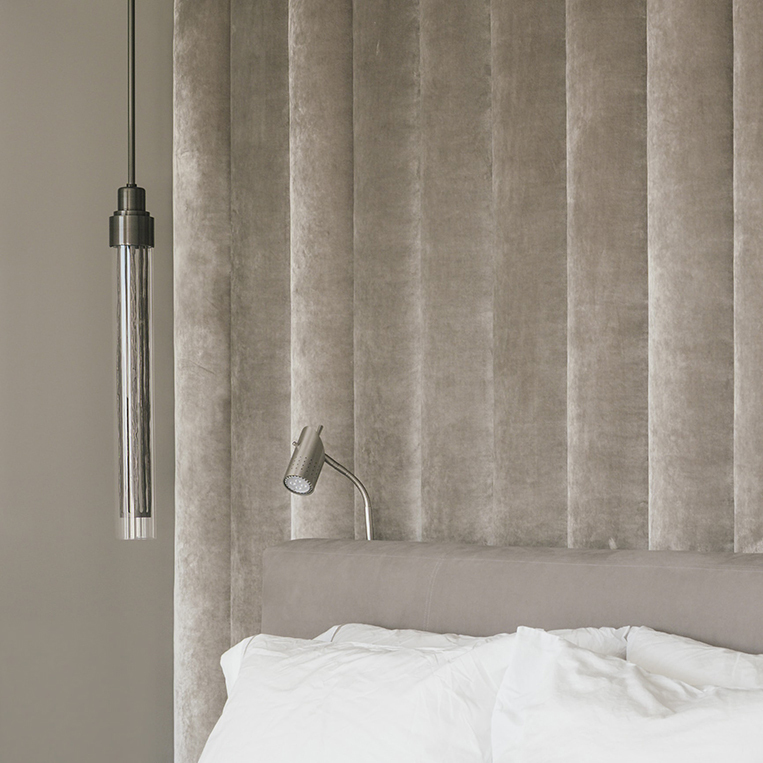 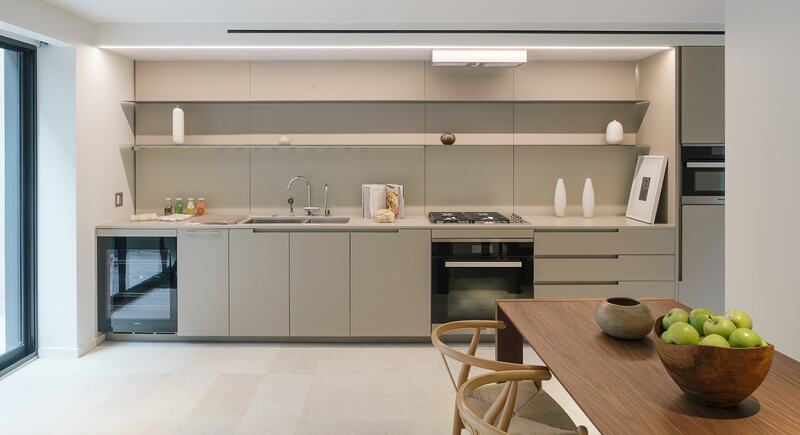 It’s easy to recognize a bespoke quality in the pairing of materials and colours of this layout. 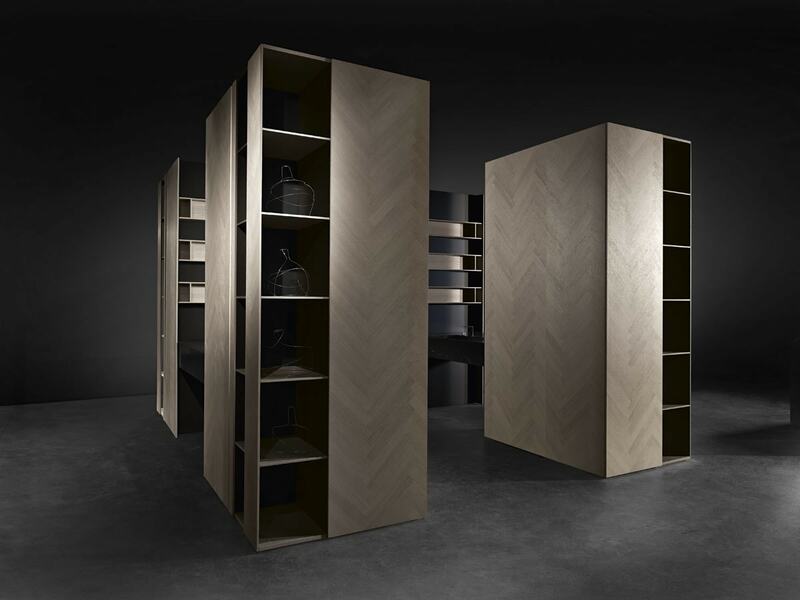 The top is made from solid wood, the base units from a concrete-look Ares Valletta melamine finish, while the tall units and open shelving on the base unit feature an elegant minute herringbone pattern. 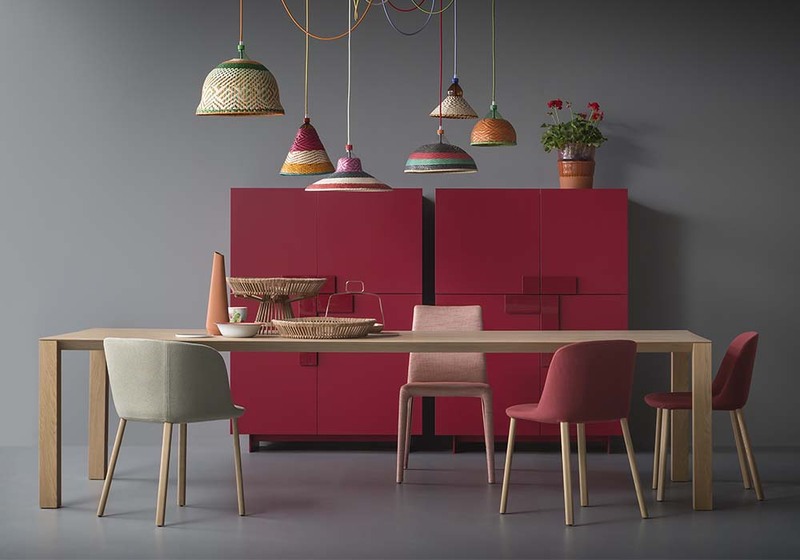 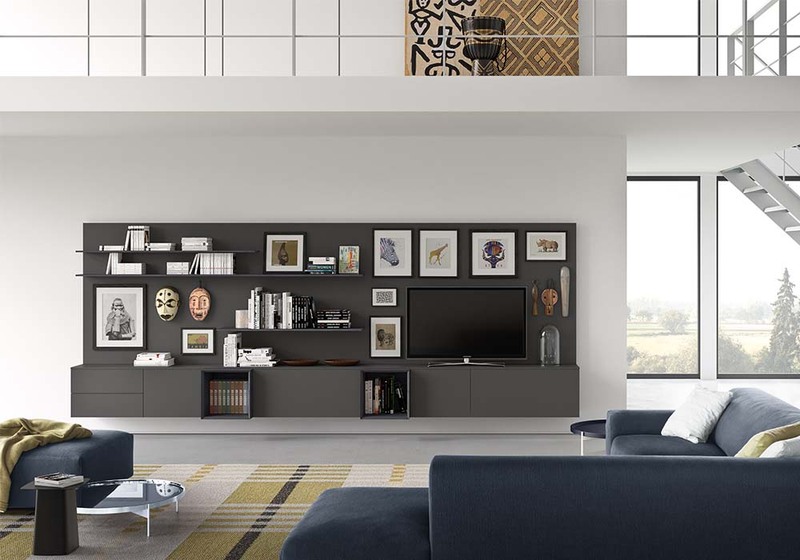 The capacious wall-mounted tall units are finished off with open shelving on one end, which breaks up the unit’s otherwise solid form while also producing a colour-blocking effect. 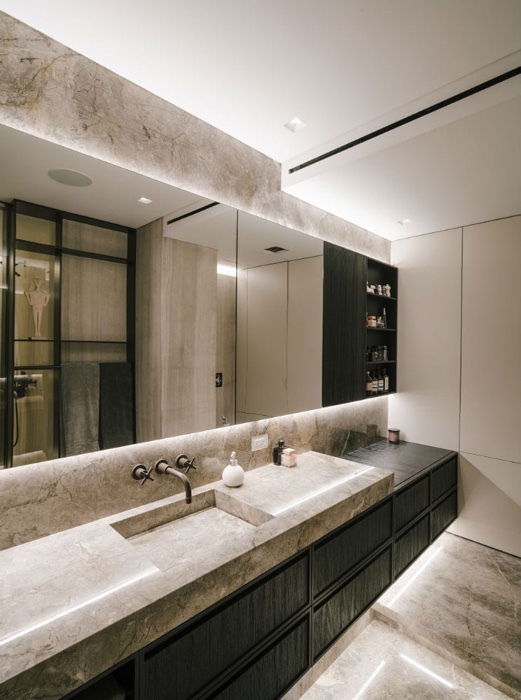 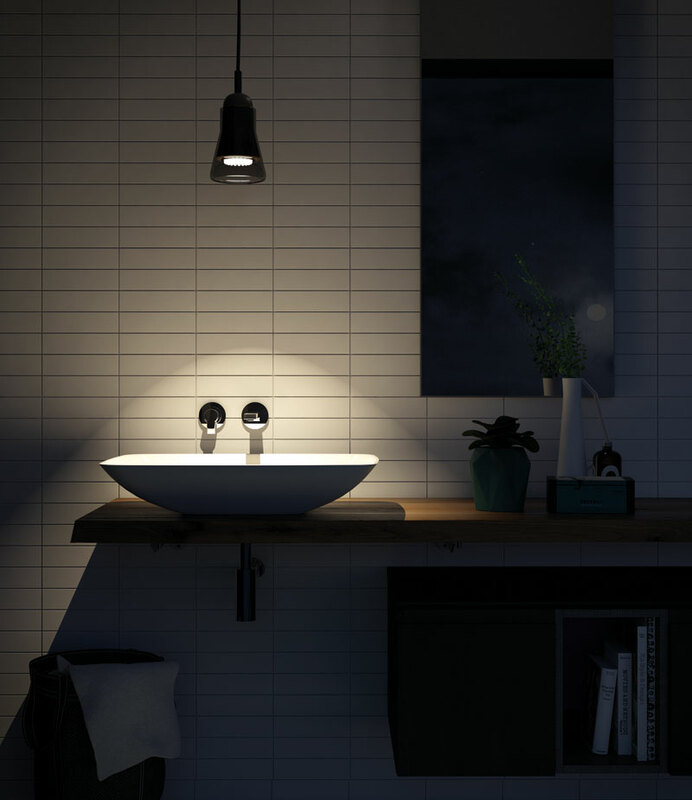 A light hung low above the basin made from Cristalplant – an innovative material resembling natural stone – bathes the bathroom in a warm, seductive light. 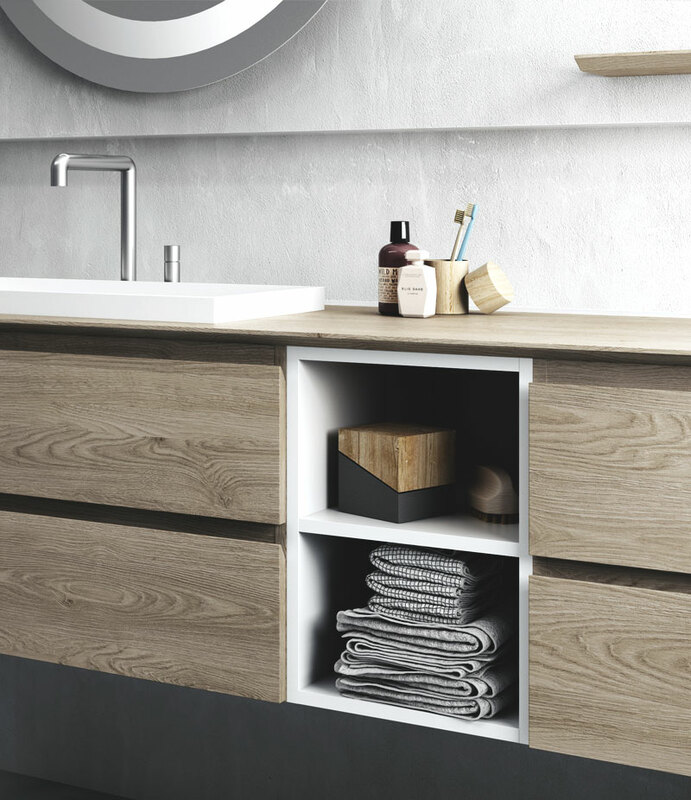 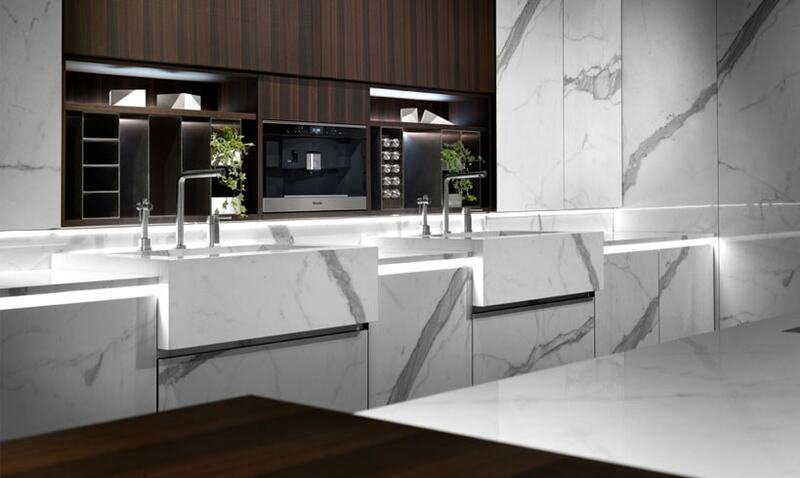 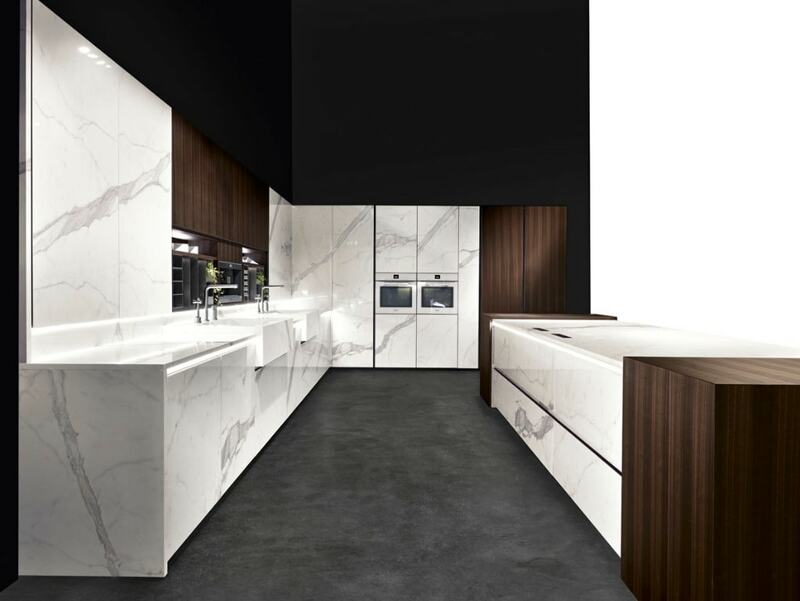 The composition’s Scandinavian flavour comes from its simple, linear unfitted style based on the pairing of white with the warm-toned latest generation melamine featuring an exposed woodgrain. 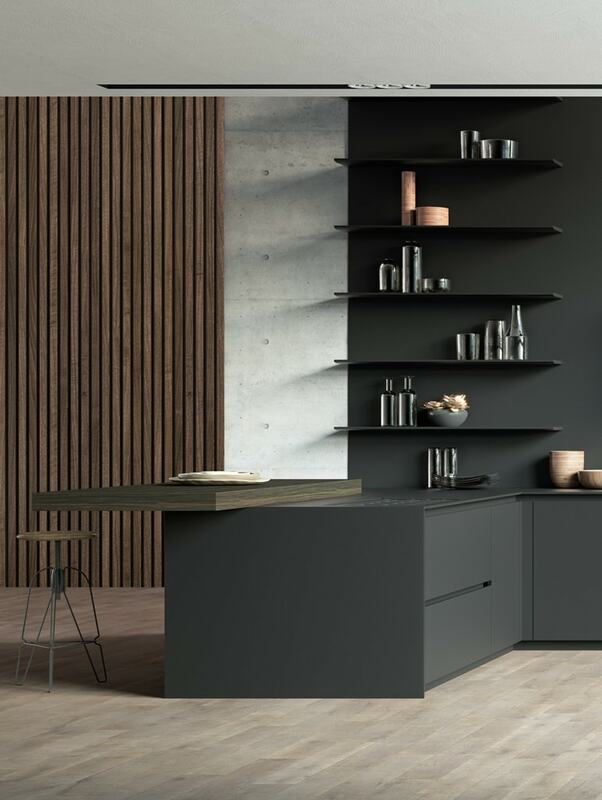 Painstaking care has gone into the accessories and details, like the simple open shelving hung individually on the wall and the Custoza 29 finish, that reproduces the warmth of wood to perfection. 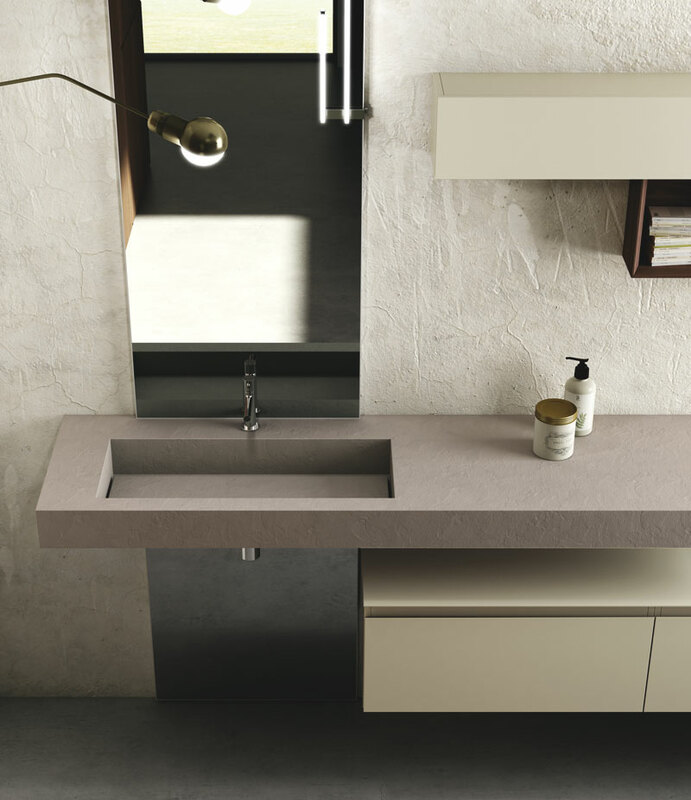 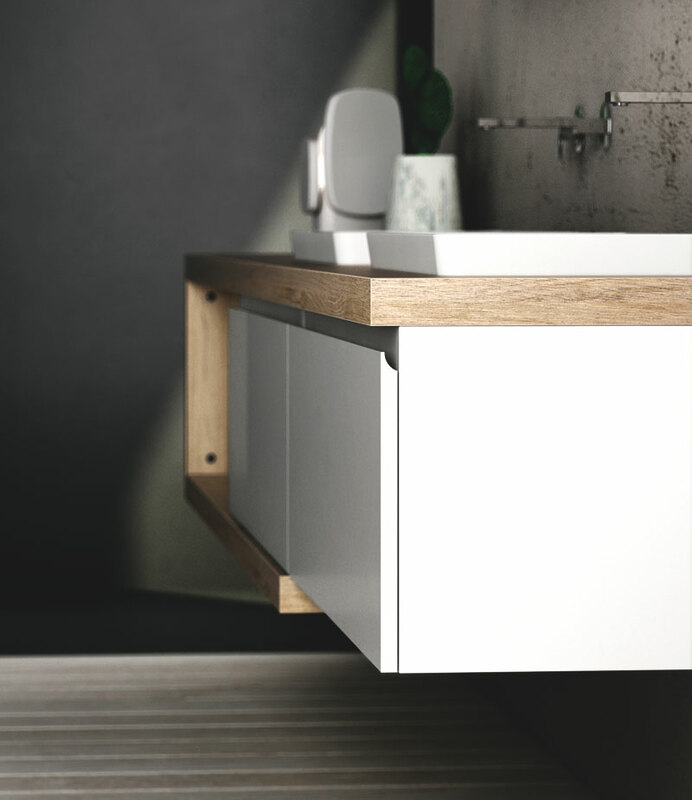 The wall-mounted base unit has a 12cm-high Corian® countertop with a sinuously shaped thermoformed basin. 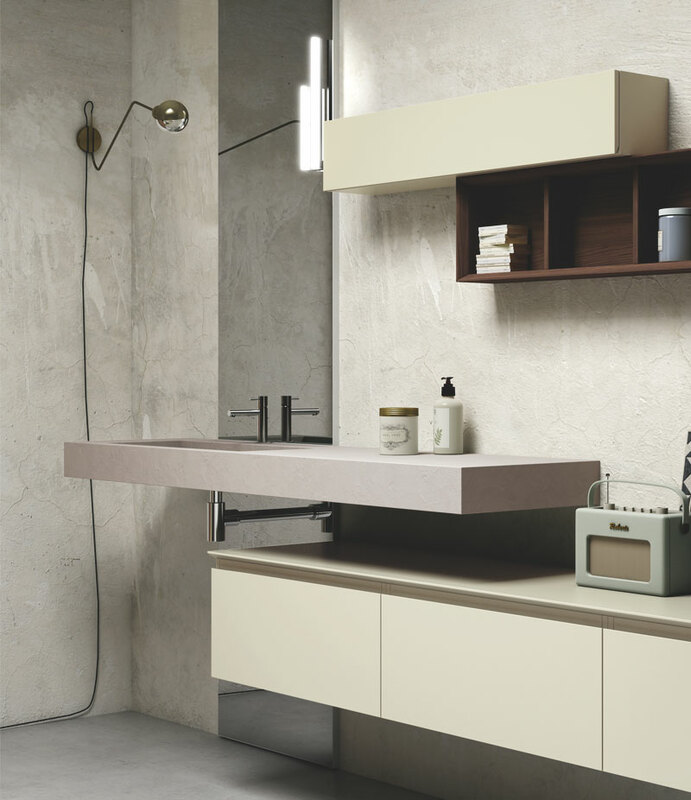 This hygienic material is easy to clean, elegant, warm and silky to the touch. 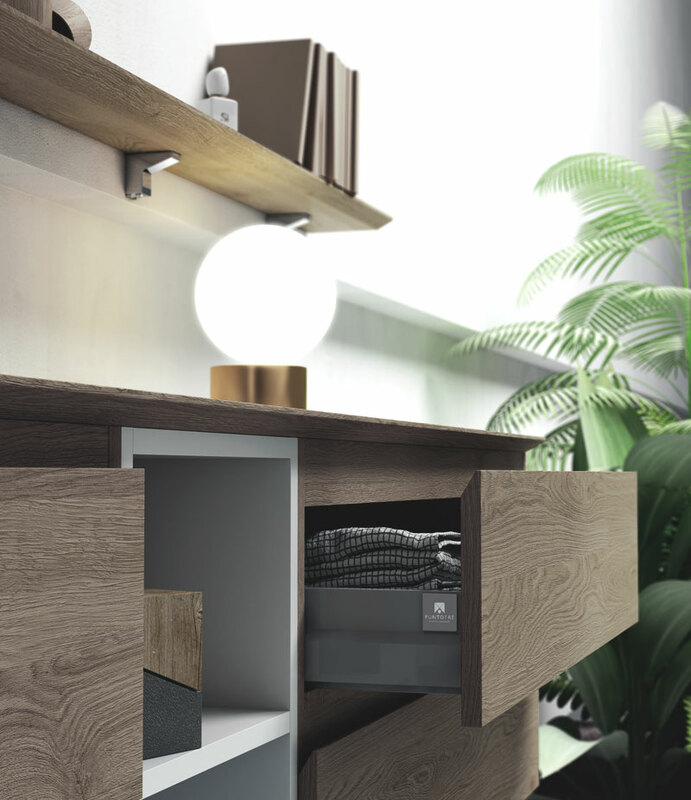 The drawers feature high-strength runners. 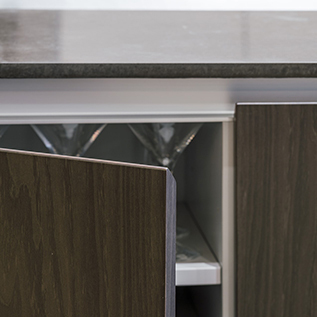 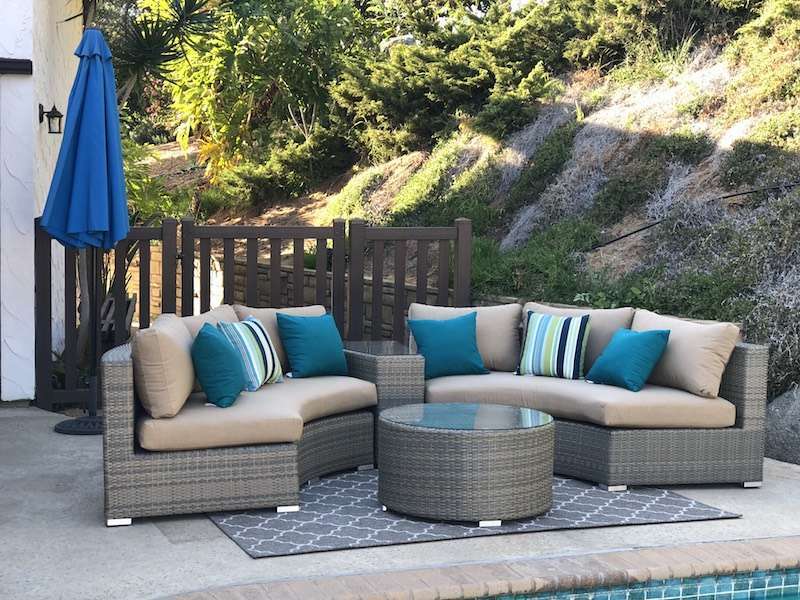 They are soft-closing and certified to an impressive 30,000 cycles.